Last week we had the pleasure of meeting up with the absolute skateboarding legend, that is Tony Hawk, in our hometown of San Diego to create some unique light painting media. This all started a little over a month ago after we contacted him about an idea to do a light painting animation project involving him and his halfpipe. We explained the idea to him, and much to our surprise, he was down! We arrived, he showed us around his office spaces for Birdhouse Skateboards, the Tony Hawk Foundation and some of his killer skate-related and film-related memorabilia. He’s a big David Lynch fan, and so are we! While creating the work with Tony, he was a big team player and held still for 50 frames during the light painting animation process. He also helped with adjustments by covering big, bright windows to block ambient light since he was the only one tall enough to do so! After the animation was complete, we had some fun doing one last photo, filling in the space around Tony with some skelebuddies doing assorted ‘skate and create’ activities. After the photo session, he told us he couldn’t visit his ramp and not skate it, so we took a little break and Tony had a quick skate session. Overall this was an incredible experience and Tony was a great team player to collaborate with! Today I'll detail some of the basic photography gear I already use (or want) and why I use it or want it along with links so you can buy it for yourself if you want. Hopefully this will help out beginners & advanced photography people alike. Why: This tripod is cheap, durable, strong, and lightweight. You could spend 3x as much for a similar model. I'm thinking about getting two because they are such a great value. The one I have has taken a beating and it has held up great over the past three years traveling the globe. Why: Sony has taken leaps and bounds over the past 5 years and it seems to have culminated in this camera system which combines all the most current tech in a relatively inexpensive camera model that ticks off all the right boxes in terms of functionality. Best sensor in the game, full framed, weather-proofed body, 4k video, great low light performance, killer dynamic range, the list goes on. Why: This is how I do my animated work, I couldn't do it any other way. It makes light-painting simple - just start & stop the exposure in bulb mode. Other more complex remotes do not have the functionality that these simple devices do. 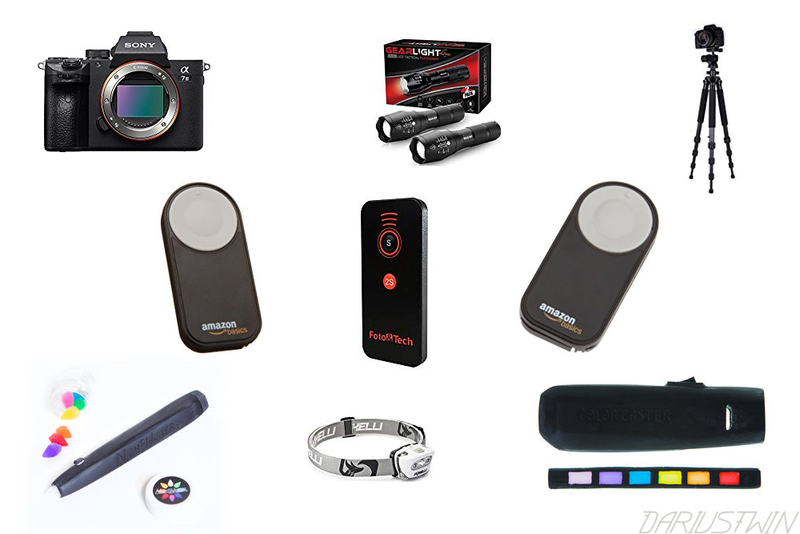 Other remotes have LEDs that will appear in your night shots or you will have to calculate exactly how long your exposure is going to be ahead of time, who wants complications? Not I! Why: These are the 4 lights that are crucial to my style of night-photography. 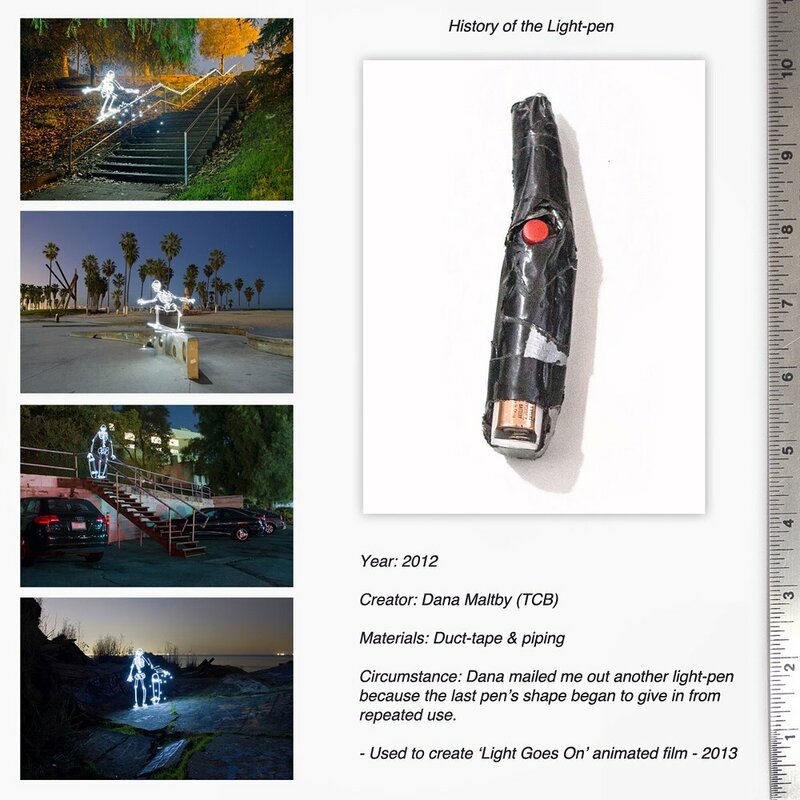 I use Night-Writer for drawing with light, I use Color-Caster for light-painting the background environments, I use a tactical LED for getting a focus (manually) or just for hiking / exploring, and a headlamp is best for having my hands free to set the camera or while climbing. Let's talk about a road trip to Yellowstone National Park, shall we? Recently, Astro Bandit and I took the journey by car from our spot close to Los Angeles, CA. 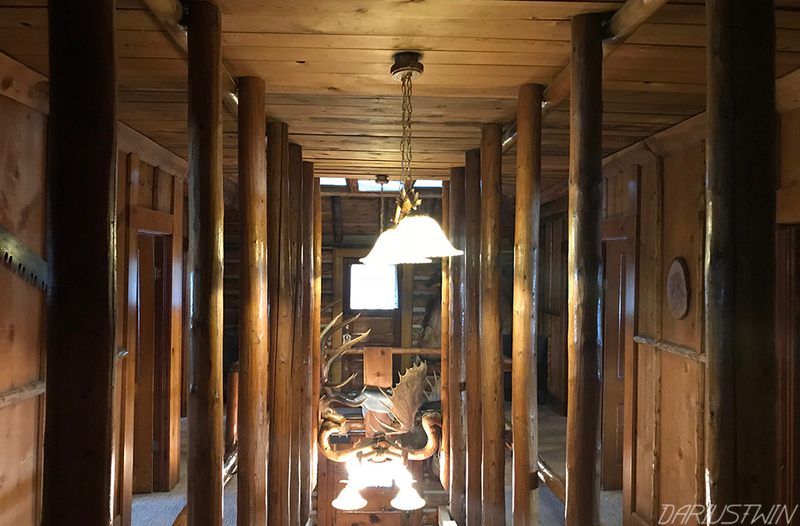 Along the way we stopped at many locations that I'll go over in this post and perhaps you might use them as an example of how to plan your own road trip! Stop 1 - Seven Magic Mountains - West of Las Vegas, Nevada. First stop for us was the 'Seven Magic Mountains' just outside of Las Vegas, NV. There's a sign for it off the 15 freeway and it's a nice little break from the long drive. I've seen this on Instagram before but seeing them IRL up-close-in-person is a different story, they are massive and colorful stacks of boulders that seem to weigh around 10-15 tons each. If you look closely, you might see a man sitting between the rocks in the middle stack, this serves as a good sense of scale. 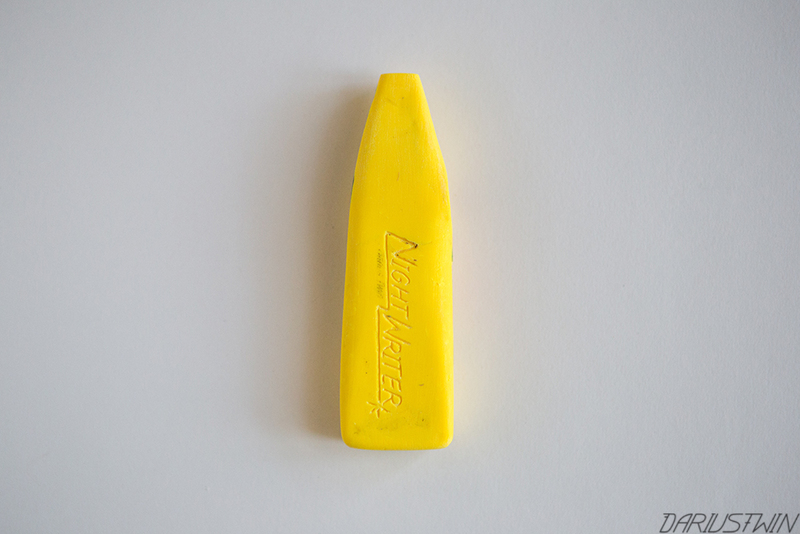 As usual, I brought my light-marker 'Night-Writer' just about everywhere in my pocket at all times. Stop 2 - Valley of Fire State Park - Overton, Nevada. We've been to 'Valley of Fire' a few times before and it never gets old, but it gets very hot as the name would suggest! 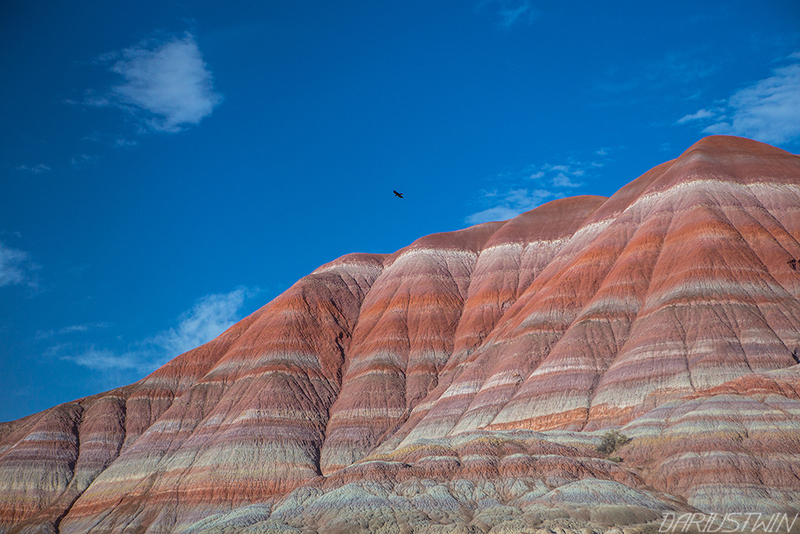 This is a colorful geological marvel shaped by water, wind, and other natural forces occurring over hundreds of millions of years. 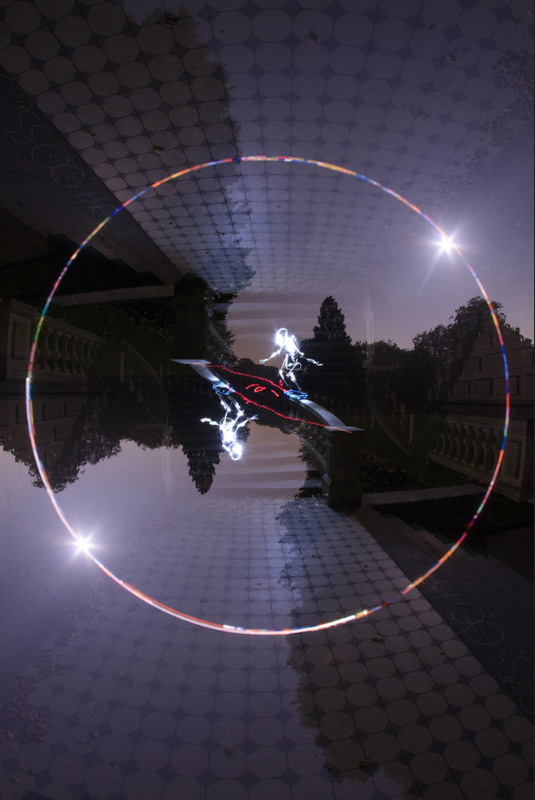 Here is a long-exposure creation using a new LED light called a 'Color-Caster' that I am in the process of developing. If there are any electrical / mechanical engineers or students in the audience that are interested in developing this idea, please send me an email! 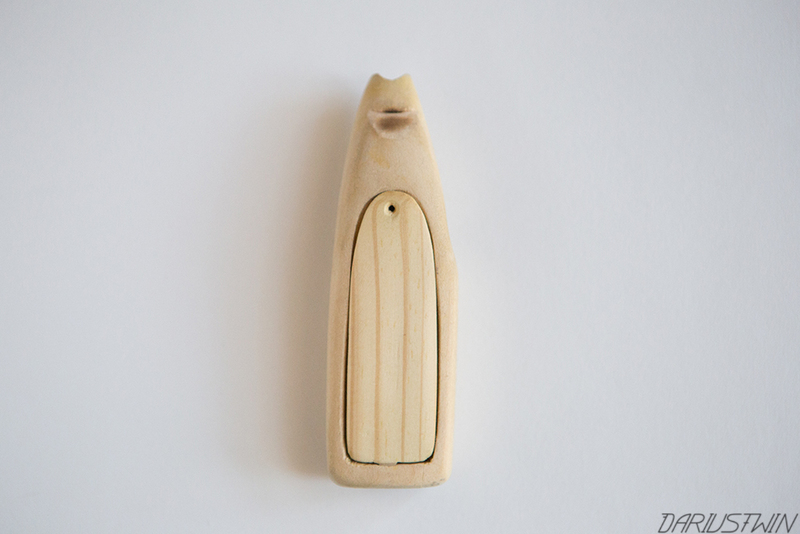 I will definitely need some help getting this design to a manufacturing level down the line. Stop 3 - Grand Staircase-Escalante National Monument - Utah. The colors on these mountains were mind-melting, I decided I was going to draw a light unicorn in front of the psychedelic backdrop. 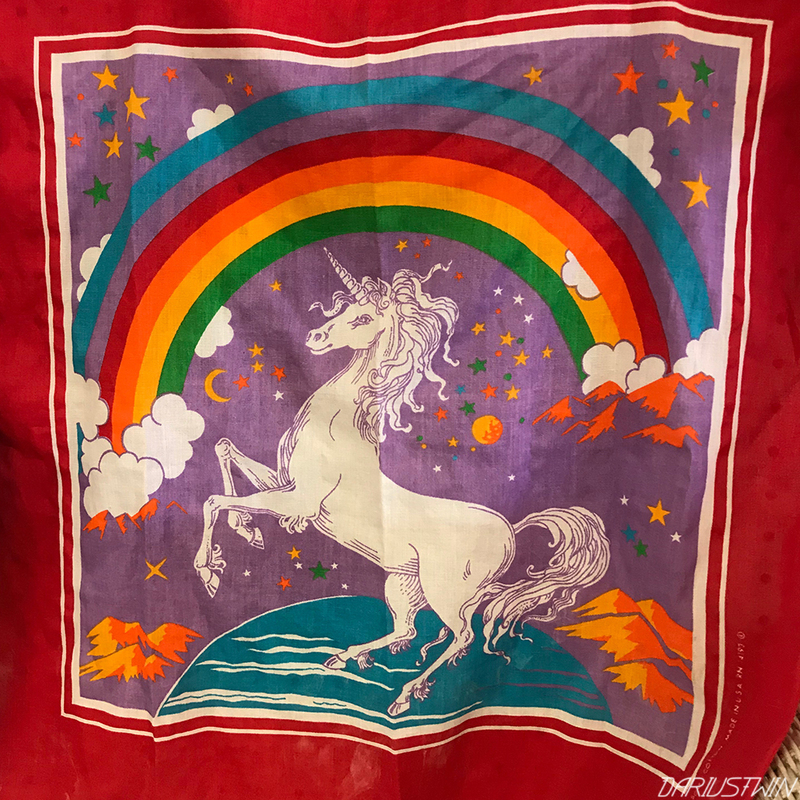 I had seen a really cool graphic on a vintage handkerchief earlier in the trip at an antique mall in Las Vegas that came to mind. Which one do you prefer? Blue Hour or Night Sky? Goodbye psychedelic hills, until our next Southwest trip. Stop 4 - Lava Tubes - Utah. At this location we hiked into some lava tubes for a bit, the weather was windy up top but rather cool and calm below. 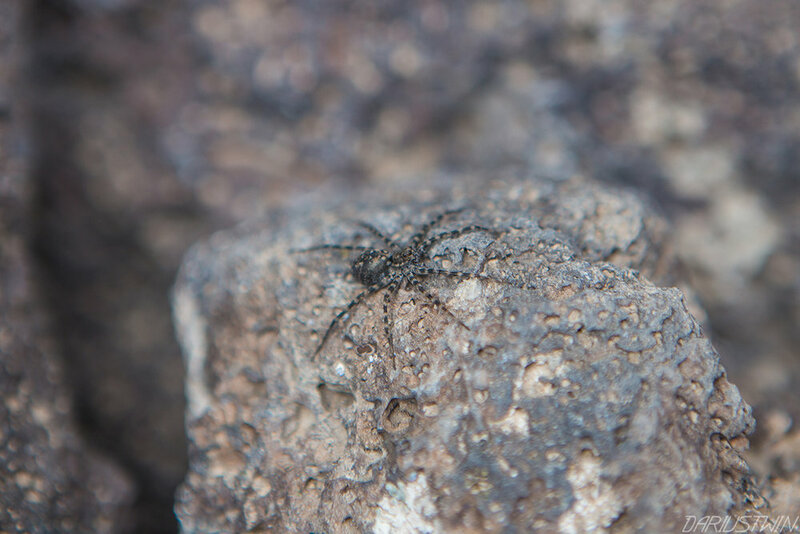 All was well until I noticed scurrying insects with every step, these turned out to be spiders, which gave me a shudder thinking about all the holes they could be hiding within the lava-rock. 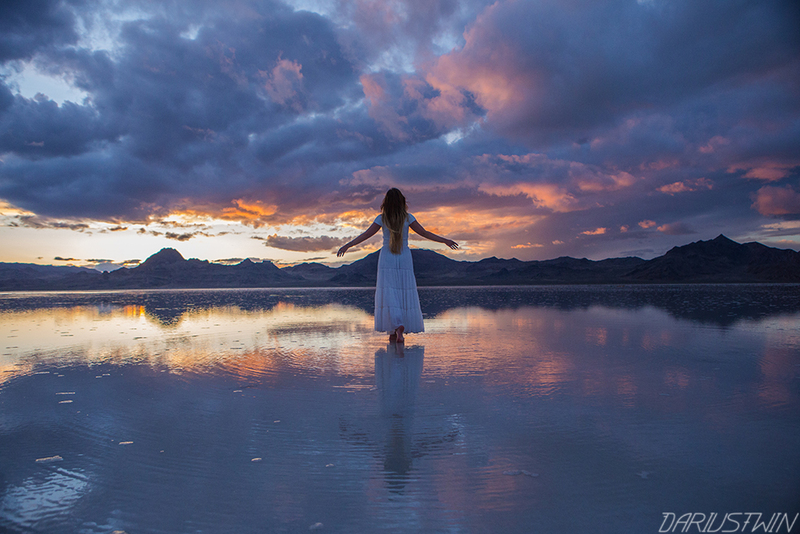 Stop 5 - Bonneville Salt Flats - Utah. 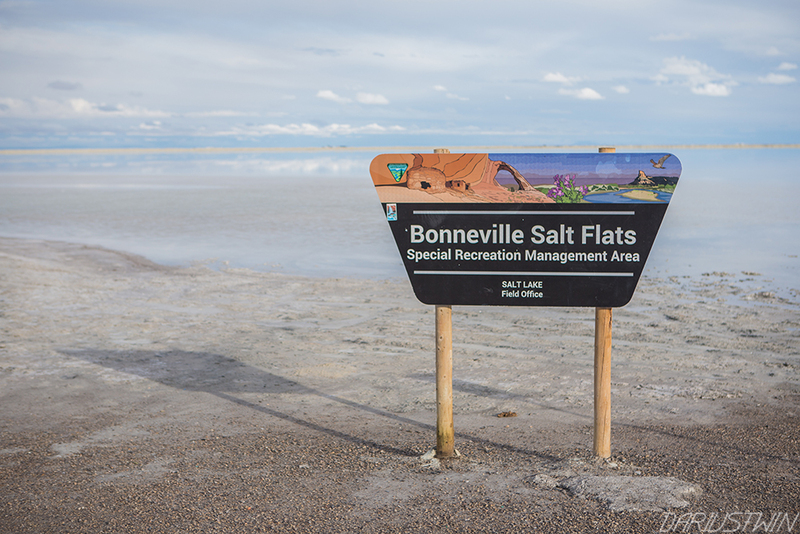 When we first arrived at the Bonneville Salt Flats, it was on the trail of a major storm. The wind was very strong and it was raining in the distance. Salt collects all over your car here with the strong winds and moisture in the air. As we stepped out into the water on the giant salt flat the winds eventually calmed enough for the most spectacular sunset I've ever witnessed. I went out again one last time when I saw some stars peak out from behind the clouds. It took everything I had (and a wind-breaker) to find the nerve to get out there, the wind doesn't just blow here; it blows through you! The image above is perhaps the best example of what a 'Night-Writer Kit' can do. For these colorful skeleton characters I am using all of the color-tips that come with the NW kit. 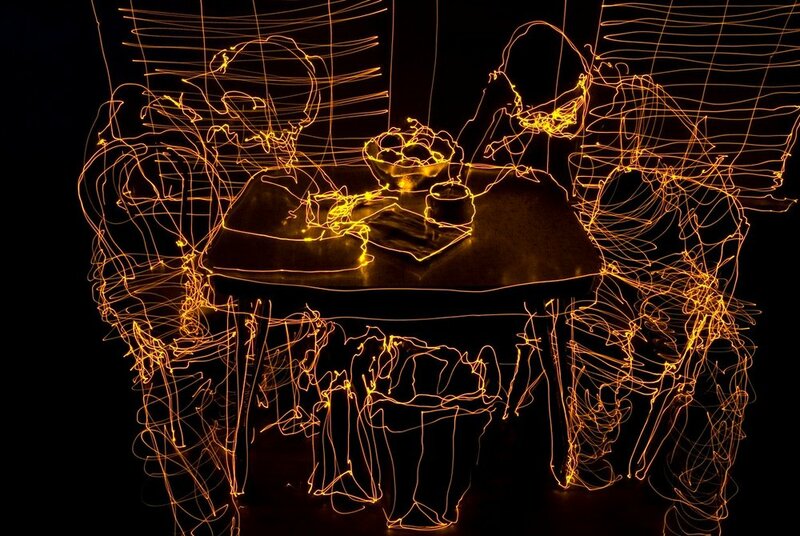 The image above took 731 seconds to freehand draw during the light-painted long exposure. Alternatively, in the image below I am using just one color-tip for the pink dinosaur. This location was truly epic and I would have stayed there all night if we weren't in such an ambitious state of travel. Stop 6 - Buffalo Cafe - Twin Falls, ID. I gotta add in this restaurant we stopped at because it was fantastic, I got 'steak and eggs' but I soon wish I would have gotten the 'Buffalo Chip' because it has basically everything a person eating breakfast could ever want. There are home-made jams for the biscuits and the coffee is great also. Definitely a must stop when in Twin Falls, ID. Stop 7 - A Quick Dip - Hot Springs, ID. It was around 40 degrees outside and raining when we visited these hot springs. 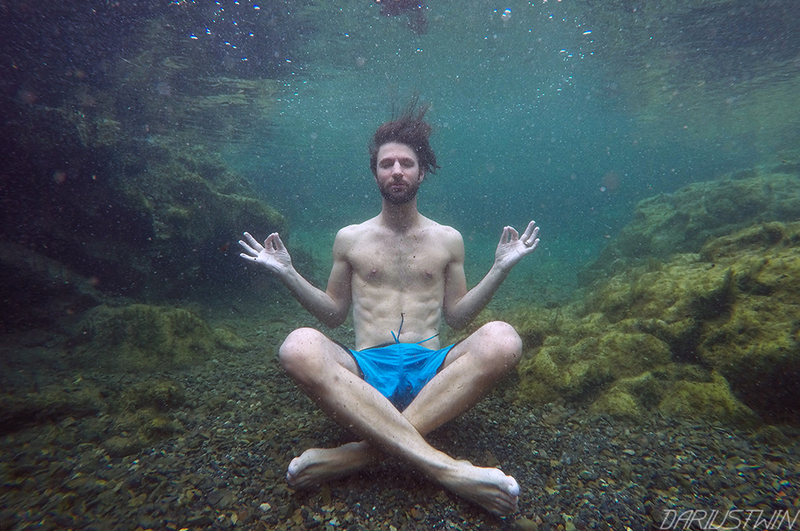 Inside, the water was a different story. It was a nice, warm, and relaxing way to break up the long journey we had ahead of us. Stop 8 - Yellowstone National Park - WY. Our first stop when we got close to the park entrance was this historic hotel that was almost certainly haunted or at very least had a long and storied history of human presence within it. Perhaps Theodore Roosevelt himself once stayed in the room we did, this was one of the oldest hotels in the area. I wonder what the 26th President of the United States would think and have to say about the current state of the nation? 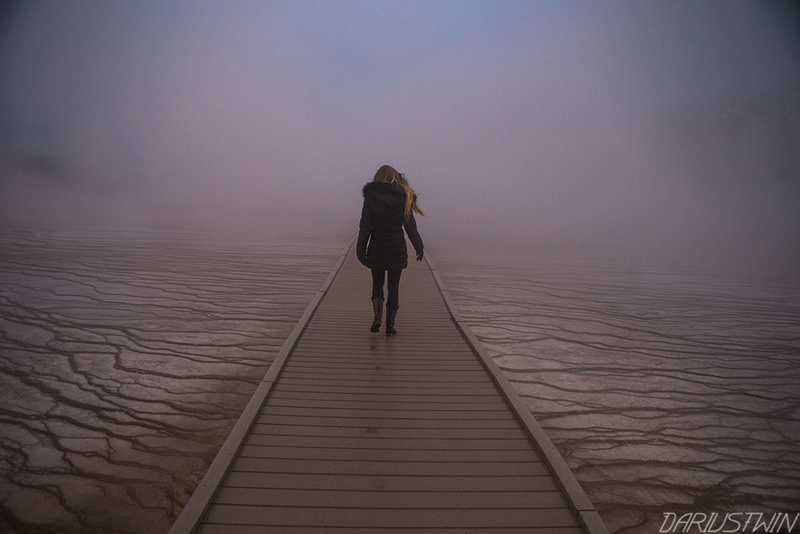 After we got our digs for the night settled we went straight into Yellowstone National Park for a quick evening trip. What happened as soon as we entered the park caught us off guard, and as a result, I only have iPhone captures to show for it; the best camera really is the one you have on you. 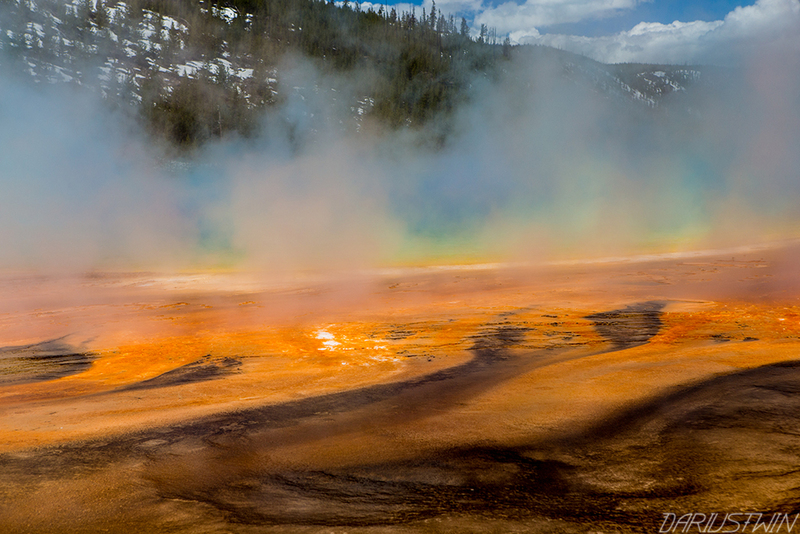 By the time we got to Grand Prismatic Spring it was raining. 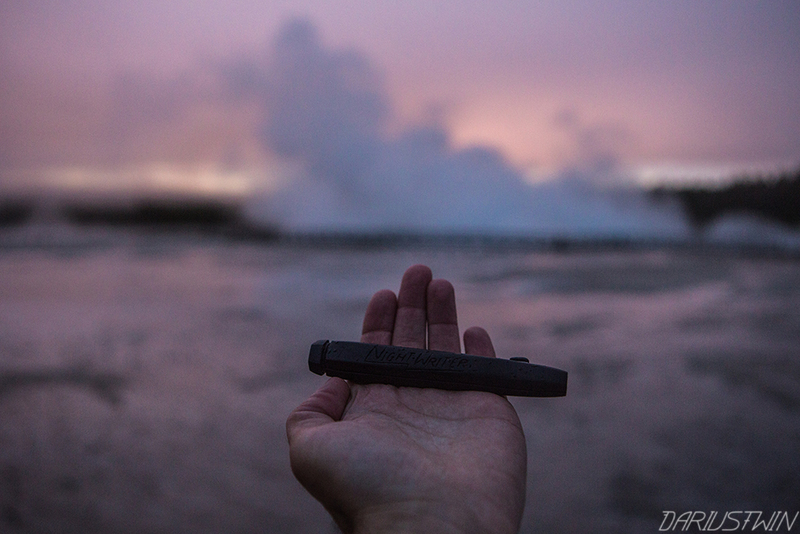 The sunset added an eerie pink glow to the steamy environment which smelled of sulfur. On a positive note, we had the place all to ourselves, which is perhaps more rare than a bison sighting! 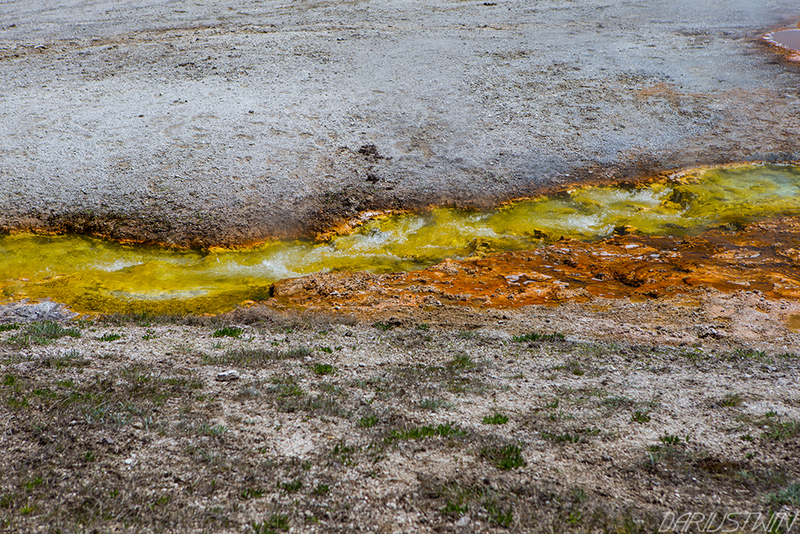 The texture of the bacteria colonies surrounding the hot springs gave this area a surreal yet organic quality. As pretty at this place looks, make no mistake it is just as dangerous as it is beautiful. Check out this list of deaths and injuries that have happened over the parks history and be warned to seriously, stay on the trails. 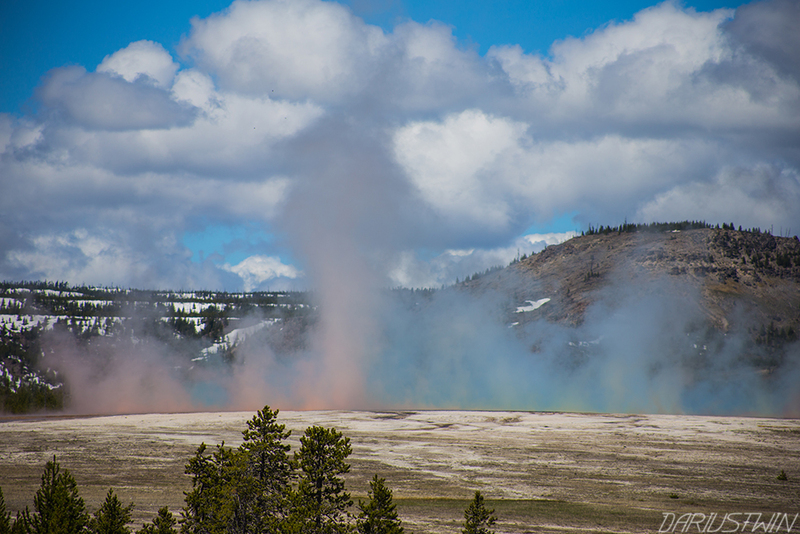 The crowds in late Spring were significant, we had difficulty finding parking around Grand Prismatic Spring during the day but by and large we found nice, peaceful and secluded places almost everywhere else we visited within the park. Stop 9 - Grand Teton National Park - WY. During mid May (which was when we took this trip), there was still snow at the upper elevations of Yellowstone and Grand Teton. Below you can see the views we were greeted with when they first opened the roads for the Summer season between the two national parks. Stop 10 - Castle Rock Campground, UT. Next stop for us after a considerably long drive from our pizza dinner in Jackson Hole Wyoming was a unique geological formation in Utah that is a campground called 'Castle Rock'. It was around 2am when we showed up and the Milky Way core was visible for the first (and last) time during the trip. I climbed through some brush to get to the base of these cliffs and took my Color-Caster out for a spin before collapsing into a deep sleep. Hope you enjoyed this post and find it useful in your future travels, stay bright! Here are a collection of images I captured last month during an Eastern Sierras road trip we took. As it was early in the season, I have a few quick tips for others seeking the same sort of adventure in their lives. We took this trip on April 9th, 2018. First we'll start with the pros - less crowds (depending on where you go), a lot of water in the rivers and lakes, snow capped mountains, pretty flowers, and generally clear roads with mostly mild to cool temperatures depending on your elevation. If you're into hot-springs, and who isn't? Mammoth lakes area is where to find some really great ones with sweeping mountain views, this is due to all the volcanic activity in the area. Some of the privately owned hot springs are just off the 395N highway while some other hidden gems are a bit more of an adventure to get to over bumpy off road trails. Over the years, some of these locations have really blown up in terms of crowds. One place you probably won't run into crowds are all the abandoned mines along the Eastern Sierras, if you do your research you will find quite a few of them! Here is one we visited and it was eerily quiet. It was only after I entered this bunker that a bird roosting in the upper rungs came out flapping around everywhere, it spooked me for sure. In the skeletal image above I used all the color-tips for Night-Writer, my light-pen that I take everywhere and do this sort of light-drawing with. The thing I love about the Eastern Sierras in Spring are all the snow-capped mountains you can see if you look West. This past year had record snowfall, so there is still quite a bit and it may last at higher elevations until early summer. Now lets talk cons - one thing about an early Spring trip is you run the risk of it still being very cold at the highest elevations and the roads can be icy. Take for example the image above, where we got stuck on an ice patch at 11,000ft elevation trying to get to Patriarch Grove on the White Mountains. Here the temperatures at night are around 22 degrees! It was pretty bad. I used a skateboard to pry and dig our way out for hours until exhaustion and then slept in our car - this is why we keep blankets, snow clothes, cold weather sleeping bags, and plenty of water in our car whenever we travel. You don't want to be out here without them, it can save your life! Even though we were stuck and a bit fearful for our future, I managed to capture this pano before we hit the hay. In the morning we were greeted by another adventurous couple that also got stuck in the same ice patch! After a few hours of digging and bringing in rocks and branches for traction along with a bit of teamwork, we all managed to break free. Here I am, a free & happy man after an exhausting night. You can purchase the hoody I am wearing by clicking the image above, my friend Justin is doing these and they are awesome! Next stop for us was Mono Lake, which is where some of the most amazing sunsets happen. Here I tested out a long-exposure using my new Color-Caster tool I'm planning on making available on the Night-Writer shop soon. 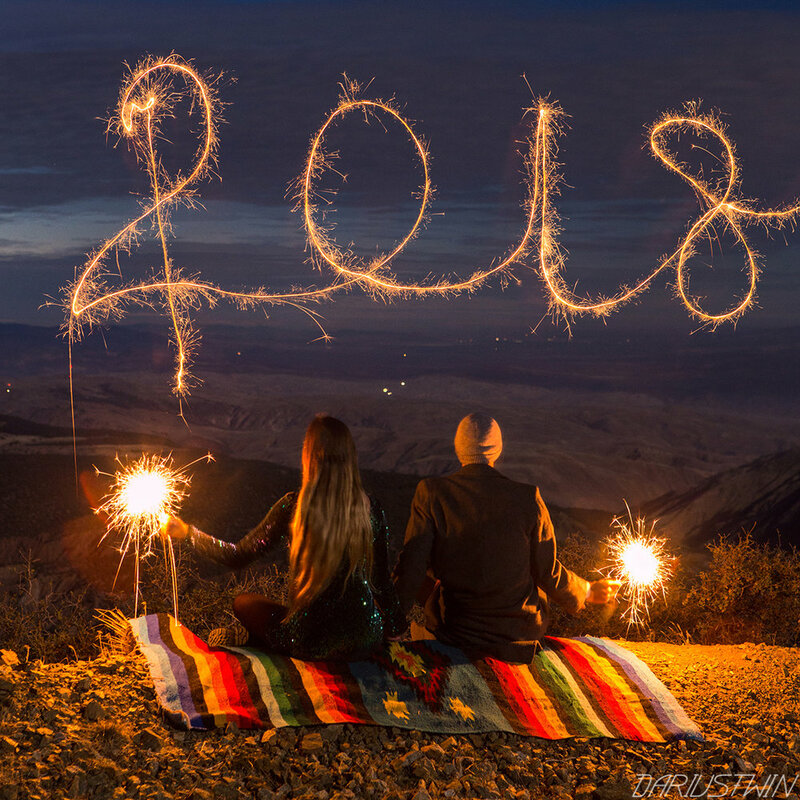 It's been a while since my last blog post, so I figured I'd make up for it with this Winter roundup of my best low light photography and light paintings since then! Here's Astrobandit and I kicking it off. We've been doing more collaborative projects lately. I've been testing out a new LED device I'm developing called a 'Color-Caster'. The tool is used for lighting a subject or the environment, you can draw with it too of course. Think of it as a bigger and more powerful version of the Night-Writer - a related but different type of tool. Here it is in use. I colored in the tree with some purple and highlighted the background red-orange (below). The skeletons were drawn in with a Night-Writer + color tips. 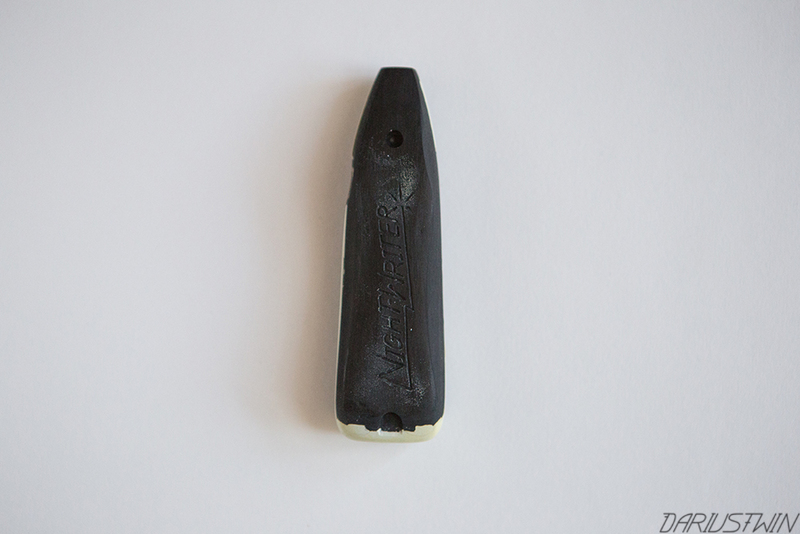 This is what the tool looks like if you draw with it pointed towards the camera. It doesn't work for detailed precision on/off stuff because this tool has a either on or off switch but it's great for one line continuous drawing. The colors are changed through use of a color-slider that you control with your hand: super-manual! Here is a color test with 4 different color-sliders I've made. I'm working on developing a bunch of 6-color combo bars to maximize creative potential with the tool. The light without the color slider is very bright! 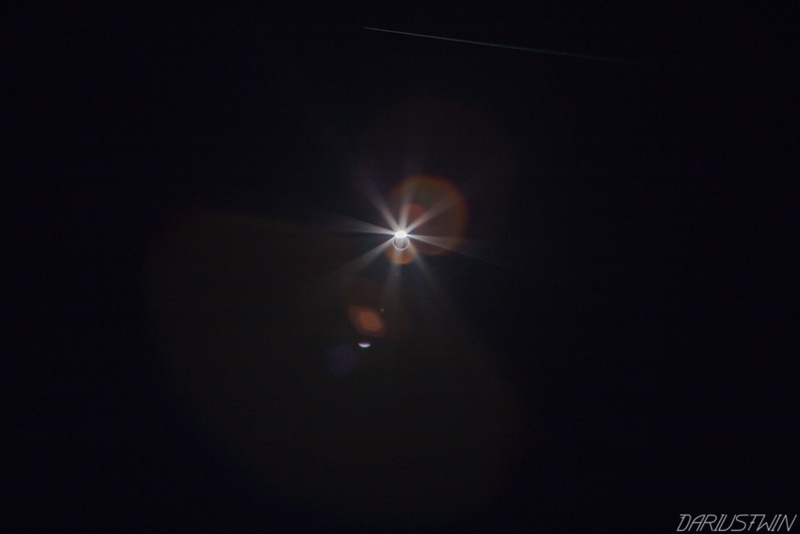 Here is what it looks like directed at the camera - quite dense and quick to flare! This was shot around f.16 (below). Color-Caster works well for psychedelic studio or portrait lighting. Quickly change colors and flick on/off for some wild visual effects. Here's a rough version of what the Color-Caster looks like in its current state, it uses a 9v battery and a large LED along with color-slider which can be stored below the tool (and give it some sweet color accents). Of course it still needs some work, but it works well and I'm excited about further testing! If you have any suggestions for me or color schemes you'd like to see tested out, give me a shout at contact@dariustwin.com or leave a comment below! I've created a few keepers in the 'Light-Fossils' department, so far my favorites are this 'Sabre-toothed Tiger' captured during blue hour (below). The timing has to be just right for these type of images. You can easily go over or under on an exposure when working in these type of dynamic lighting conditions. My guess paid off here! Speaking of dynamic lighting, fog presents it's own unique challenges! Carry a lens tissue because you may need to wipe off your lense after every capture. I was happy to create a nice brontosaurus skeleton in front of an abandoned camp during this dense fog. I love the way you can see the colored light dissipate into the moisture! We woke up around 4am and did a few once in a lifetime shots like these below. I'll kick it off with this one, it has become a personal favorite(below). Of course I had to try a light-fossil. here is a Woolly Mammoth with the 'Super Blue Blood Moon' on its back. Since we've moved out to the mountains we've gotten a lot more weather than we did in Los Angeles. When it's cold and raining in LA, it is often snowing an hour North on the mountain! 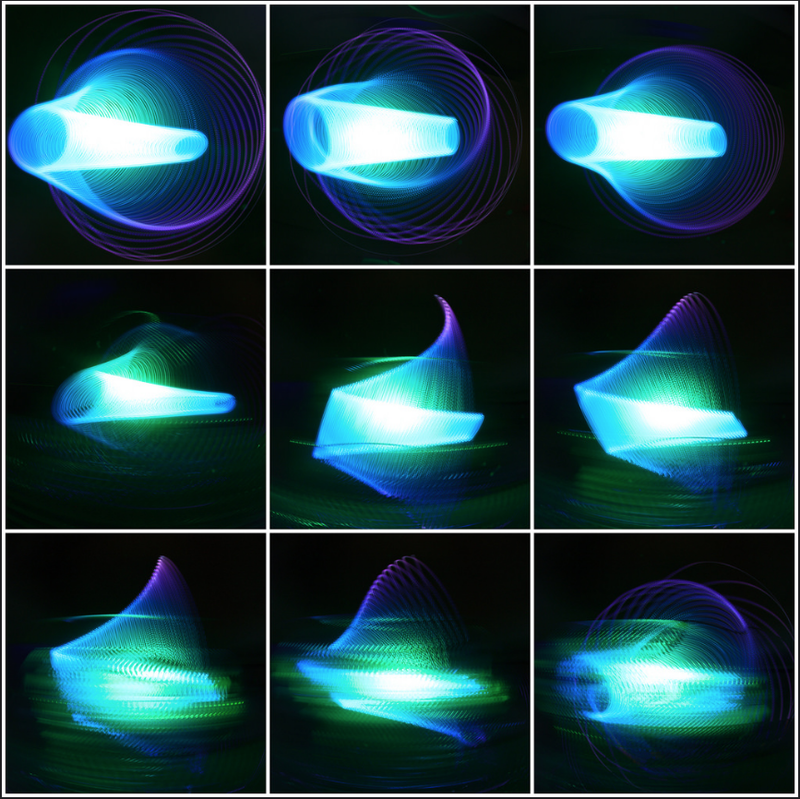 here are some light-paintings I did in ~11 degree weather. Layering up is an absolute must along with a facemask for the wind! I especially liked this one of the polar bears. On my way back I noticed footsteps in the snow of a bobcat that had been following my tracks. Here I trekked out a bit and illustrated a snowfox above the mountain village. More things to come, I will be blogging a bit more during the Spring once we get to do some road trips again! Until then, stay bright and I hope you have enjoyed this light update! Here's a similar buyer's guide list I did in Spring of last year. These are quick Amazon.com links and prices to the products I use already, or would buy if I was looking to upgrade. This list is intended for people looking for great products used in low-light photography. Sony a7riii - $3,198 (body only) - Top dog among consumer mirrorless options, it has all the important features that pro/consumer photographers and video creators wanted - 4k video, great in low light, super dynamic range, and much better battery life than it's predecessor. Nikon D850 - $3,296 (body only) - Top dog of the tried and true camera brands, top ratings also. Canon EOS 5D Mark IV - $3,200 (body only). Olympus OM-D E-M5 Mark II - $800 (body only). Sony A6000 - $500 (with 16-50mm lens). Nikon 14-24mm f2.8 - $1,696 - Big and heavy, but beautiful. Canon 24-70mm f2.8 - $1,700 - Good versatility. Rokinon 14mm f2.8 (for Canon) - $189 - Cheap and good, what a combo! Neewer 66in Carbon Fiber Tripod - $95 - Carries up to 26lbs. Night-Writer Kit - $65 - I use this for drawing detailed light-lines during a long exposure. SOLARAY PRO ZX-1 - $50 - High power / rechargeable LED for casting light and getting a focus. It's times like these that I wish I had a little drone to send up into the atmosphere and take a picture of this insane double rainbow from the sky's perspective with a very small and fast wide-angle lens to get the perfect full-circle rainbow. I'll hang loose until then.. Welcome to Maui, you're on island time now! This is a land of comfortable temperatures for the most part, it was about 80-87 degrees whenever I looked at weather forecasts. It rained often and high winds affected the North side of the island more than the South. We traveled around the island extensively, taking the Hana highway, visiting the volcano atop Haleakala for sunrise, and hiking to countless waterfalls, and of course visiting lots of beaches with sands of white, red, and black. Comfortable temperatures can change if you plan on visiting the top of Haleakala, the volcano that sits around 10,000 ft elevation and was about freezing temperature when we visited. It wasn't the low temperatures that got us there, it was the intense and biting wind chill! On the top of this volcano I felt as if I was on an island in space rather than just the Pacific. People come up here to see the sunrise, but the other stars are the best part for me! If you plan on visiting Haleakala, definitely pack for the freezing temperatures and be sure to reserve a parking space at the top! This is a relatively new thing as of February 2017, and it helps with mitigating extreme crowds - they will turn you away at the entrance if you do not reserve a spot! Ok, now let's talk animals.. At many of the beaches on Maui you might see sea turtles! These are well documented in petroglyphs scratched into lava rock and on t-shirts and stickers all over the island. So I got a bit of inspiration from that and did my own light version at Ho'okipa beach, where we saw some turtles earlier that day. Cops kicked us out shortly after this image, the park closes after sunset. Another small and interesting reptile that inhabits the island is the Gecko! This little friend will eat those pesky mosquitos and just about any other insect it can catch. They are fast little critters and can crawl almost anywhere because of the setae under their feet that allows them to hold onto most surfaces, unless the surface is wet! One of the more interesting geological structures we visited was a trail called 'Dragon's teeth' (Makaluapuna Point) - this was at the edge of a golf course in Lahaina. I thought a Spinosaurus light-fossil would be a good addition to this scene. There's a few myths that are widely known around Hawaii, one of which is the 'Night-Marchers' - the story goes that if you are out hiking at night, and hear a conch shell sound in the distance followed by mysterious night-marchers holding torches, you should immediately lie on ground and not look at them. For if you look, they will kill you unless one of the spirits confirms that you are a native ancestor of their people. While I did not see any night-marchers on this trip, I was cursed by mosquitos trying to get this image above shot in Hana Bay. I hope you've enjoyed island time, and some of the images I've illustrated with my Night-Writer light! Until next time, stay bright! This sort of opportunity only comes once in a great while and I was excited to see it happen in person! After following all the news reports, double checking the social-media accounts of well known Oregon-based photographers, doing calculations on Nasa's eclipse-app, as well as checking traffic reports, closures and warnings from Oregon Dept of Transportation, we finally decided to hop off the fence here in Southern California and just go for it! Astrobandit and I drove 12 hours North to Madras, Oregon starting at 6am. The goal was to be in the middle of the totality path for the 2017 August 21st Solar Eclipse. That night we slept in our car and woke up to what must have been thousands more that had arrived in the middle of the night or perhaps early that morning. The people parked next to us had driven from Washington and the people next to them had flown in from Japan! The general mood was filled with anticipation and a common sense of purpose, everyone was really nice to each other! It was a beautiful thing to witness in person because all I've read in the news recently is doom and gloom, this was the exact opposite of that! At 10:20am is when it began, not that either of us could see the transition much.. We had opted not to get solar glasses - this was a pretty glaring mistake in the transitional phases of the eclipse, but I figured the most important part was the totality. Here's a video I recorded on my phone (and a few other cameras) of the totality happening, one of the things that was a little unexpected was how much the temperature changed during totality, it must have dropped 20-30 degrees in just a few minutes! Also, it produced an incredible 360 degree sunset! 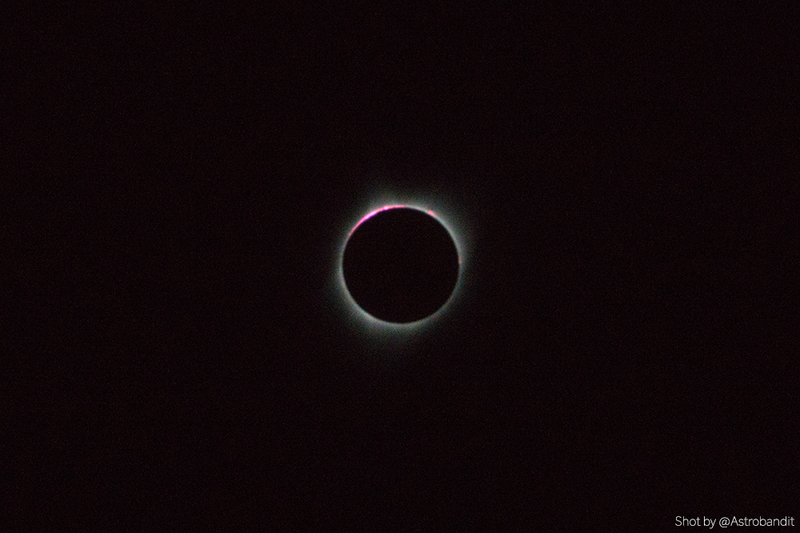 Here are some of my favorite images we captured of the eclipse, I was trying to take some long-exposures to get stars in the background but that proved totally impossible because the sun was still so bright behind the moon! The traffic exiting Madras, Oregon was some of the worst I've ever experienced - historic for sure. Bottlenecking everywhere due to all the 2 lane roads and massive camps of people all leaving at the same time. Add on a few small towns in the middle with a few traffic lights that were not designed to accommodate millions of people and we were looking at about 10hrs of 2mph traffic from Madras to La Pine - a terrible price to pay but an surreal experience I'll never forget. Thanks for reading! If you'd like to see more nature related imagery, check out my landscapes gallery here! Here's my rendition of the American Flag done with light-painting shortly after sunset, to view large click here. I used this rusty barbed-wire gate as a template of sorts, it took a few tries to get it right. You can see what I mean in animated .gif below. At first, my Night-Writer light was not bright enough to compete with the recent sunset, but over time it dimmed and I was able to get something I liked. For this image I used a newly designed 'Pyramid' color-tip. This custom design was Red, White, and Blue for July 4th. America's 'Independence Day'. For each color in the flag, I rotated this new tip design at a slightly different angle toward the camera lens. I experimented with different speeds of light-drawing also, at first I would move in slow motion with the light, toward the end I began speeding up to balance the light-drawing brightness with the environment. You can see some of the stars come out illustrating how dark it became toward the end of the animated .gif (above). Astrobandit and I watched the fireworks in Ventura, CA this year. I wasn't feeling the idea of lugging around a tripod and camera gear, so I opted to use my phone as the camera of choice for this particular occasion. Here are some images I took of the fireworks using an 'iPhone 7 Plus' and NightCap Pro App. I held the phone steady on my knee (in place of a tripod) for a second or so while the camera captured colorful streaks of each big bang! The colors aren't perfect, as you can see in way the sensor picks up red colors, but overall I thought 'not bad' for a little pocket camera! Let's get into the basics first - this is no easy task and if you think animating on paper is tough, this is a bit more physically demanding than that, it's hiking, balancing, squatting, wild hand gestures, intense focus, and most importantly, a grand vision! Sometimes, I will reference videos on youtube (pressing the spacebar like a spaz to play/pause the frame). Other times I will reference images and videos I capture myself, it all depends on your vision. After you can ace the flipbook test, it's time to move toward the light-art animating. 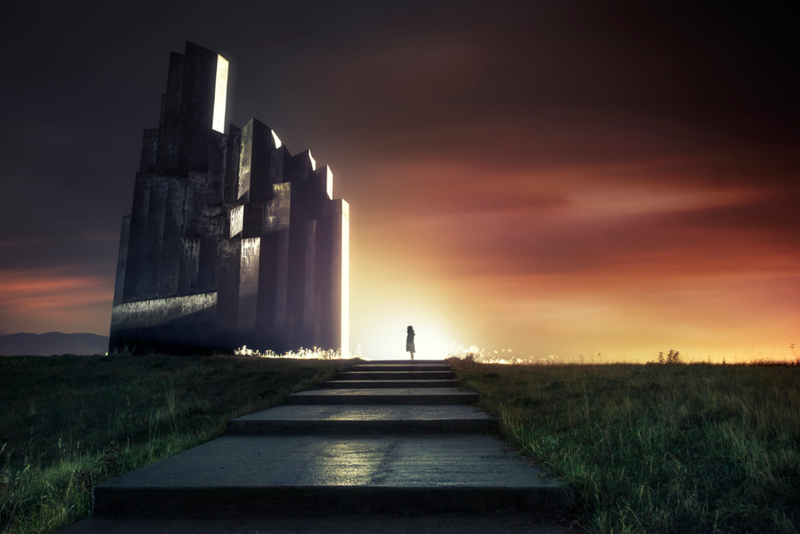 For starters you need a dark location - somewhere that has a unique view, or perhaps build it yourself? Up to you! 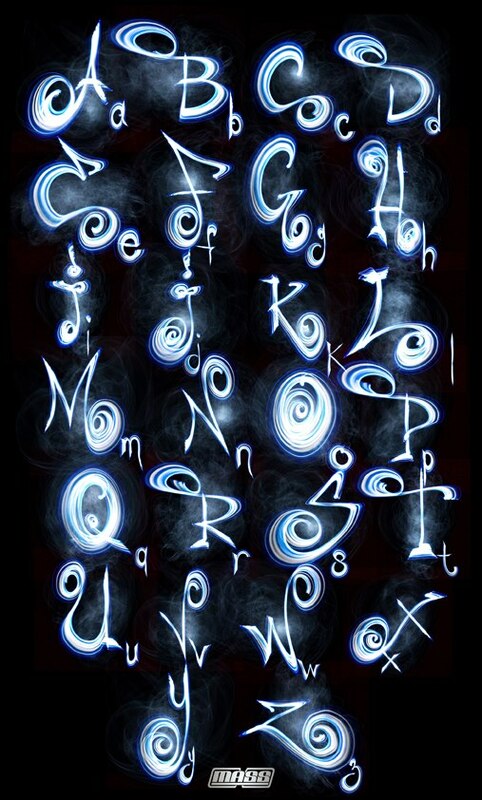 You'll need a DSLR, remote, tripod and light - I use Night-Writer because I made it for drawing with. 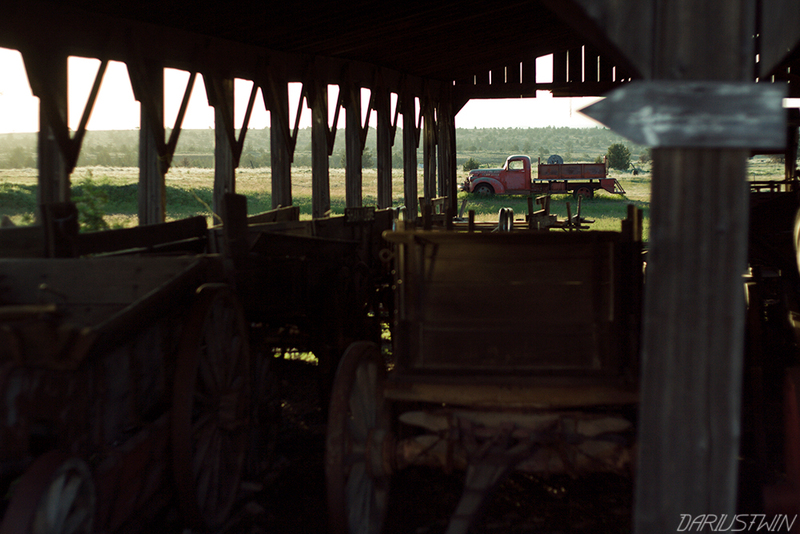 First part is setting the scene - I like to scout locations in the day so I know exactly what I'm getting into at night. Often I will take phone pics to get a general idea of what angles I'd like to use later that night. 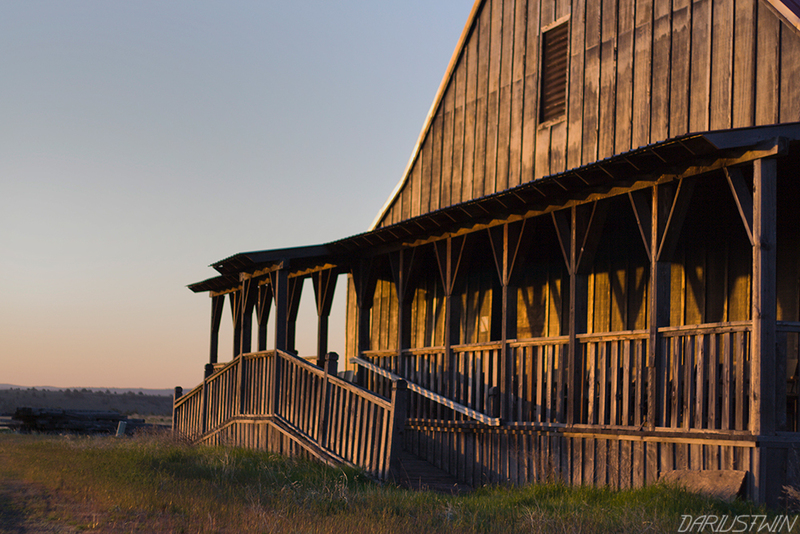 Once on location you'll get to the spot, set up your camera on a tripod, take the lens cap off and start to compose a scene using a high-powered light. Manually set your focus on the area you would like to animate around and set your camera to 'Bulb'. You may need to adjust your camera settings so that you can use the remote. After you think all the settings are correct, it's time to test it out - do something basic to start with and then adjust camera settings to get the right look you're going for. Using your remote - trigger the beginning of the shot, then hop in front of the lens and draw each frame (I like to use a rock or something to mark where my character needs to be for each frame), slowly move your character and motions with each consecutive long-exposure (just like with a flip-book). Trigger your remote for the beginning and the end of each frame in the animation, I like to animate at 24 frames per second because I think it looks best. 24 frames is equal to one second of footage! Once I have all of my frames, I will edit them using lightroom or photoshop so that they all look like similar exposures. After this, I open all the edited images in Adobe Bridge so that I can see the first frame to last frame files in one place visually. I open the first frame in photoshop and then stack the next frame on top of the first into separate consecutive layers. Once I've compiled all of my 24 layers on top of each other, I open the 'Timeline' tab from the 'Window' top selection. There's a button that says 'Create Frame Animation' - click it. You should see one frame in the timeline, but you will need to select the upper right drop-down menu, there is a selection called 'Make Frames from Layers'. Use that to have all of your layers import to the timeline. Now it's time to select the frame rate, adjust the delay as needed to make for the smoothest animation. I like to use a .06 sec delay on each frame. After you're happy with your animated sequence, you can export it to video or save it as a .gif, you may need to resize the file along the way. 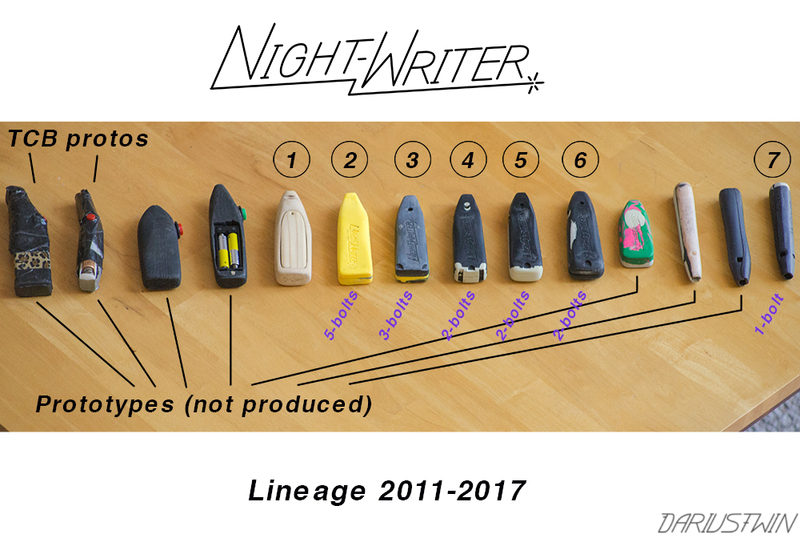 With the release of the 7th iteration of 'Night-Writer', I thought I'd give a bit of context as to where the design came from and where it's going. A custom LED light may seem like a fairly mundane concept to most, but for someone with illustration chops it's like the difference between a surgeon using a steak-knife or a scalpel when operating. There are certain nuances to the design that make it better for drawing with than your average LED light. Think of it as an instrument! Here's a link to the current model of the Night-Writer (V.7), it can be purchased right here for a limited time. I have hand-made every version of the LED tool (V.1 - V.7) and each is signed and dated on the interior. Here's to the next evolution, stay bright! It's good to try new things, so I brought a step-ladder with me on my most recent night mission during the last full moon. The few extra steps gave me enough height to animate my red light-skeleton running up the walls ala Gene Kelly from 'Singing In The Rain'. I used a remote controlled color-changing 'LED Pod' to color the shadowed areas blue and a Night-Writer with red color-tip for the skeleton character. For these type of time and energy dependent projects it helps to have a well defined process and stick to it through the length of the shoot, otherwise the animation will never get done. You've got to find your groove. 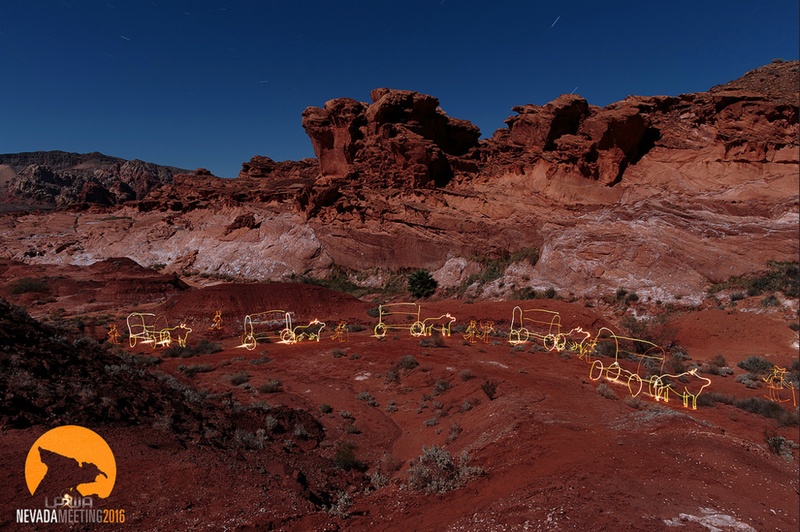 Mine was roughly 3 seconds of blue light exposure from the 'LED-Pod', and then drawing out the skeleton while the full moon illuminated the background, each long exposure frame was about 150 seconds. The next image was a special one for my Mother, it was Mother's Day after all. Here's a 'Mama Bear and Cubs' walking along a fallen tree under the full moon. Thanks for reading and stay bright light fam! See more in the Animation / Licensing collection. The other night I checked out a nearby spot that has a burned down section of the forest. A stark reminder of what can happen over the Summer when the weather is hot, dry, and windy. This must have happened a handful of years back, you can see smaller growth making a comeback but it could be many more years until we see trees here again. Here's a blend I did of all the frames in the animation above so you can see the frame by frames. The steps are a little wonky, but hey - he's on fire! Fire effect produced with red El Tape. 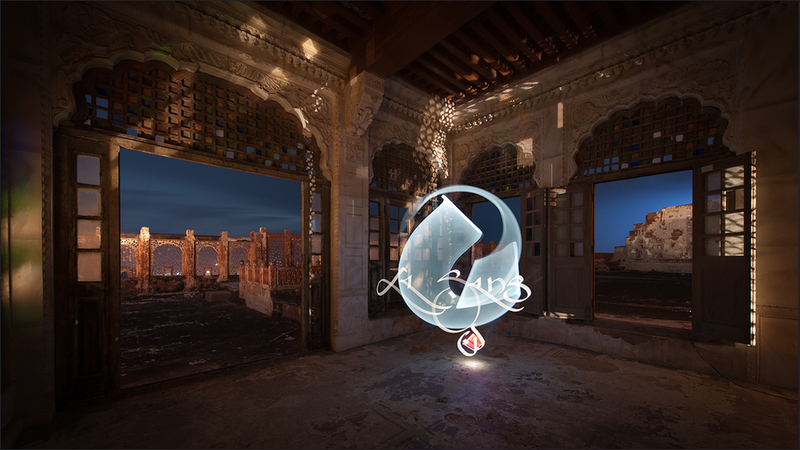 The next light-art challenge is a different type of photo-merge. This one is done in-camera during a long-exposure. 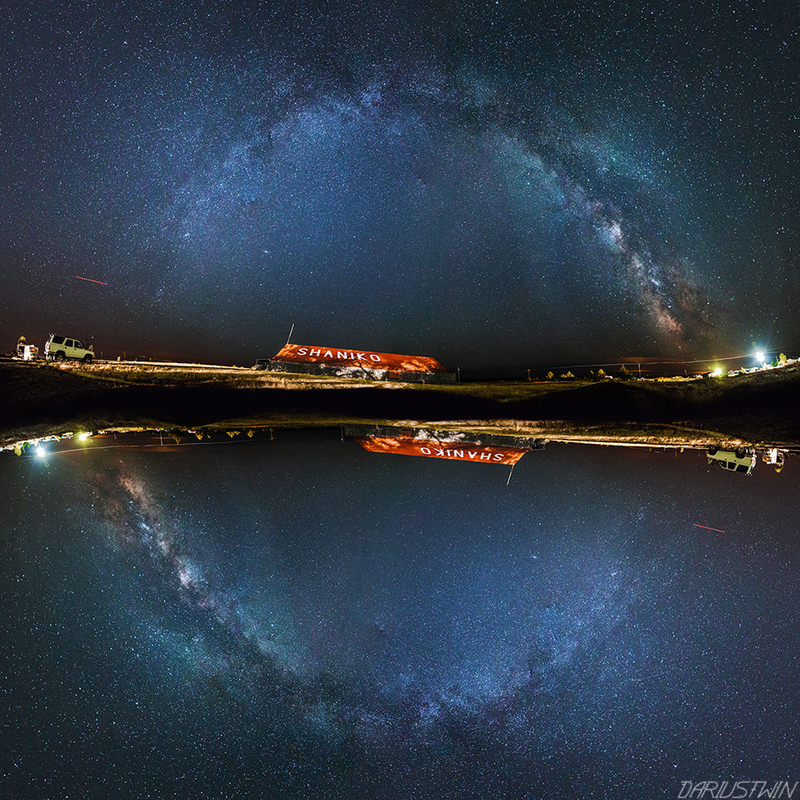 It's essentially a double exposure using the lens-cap and two tripods. 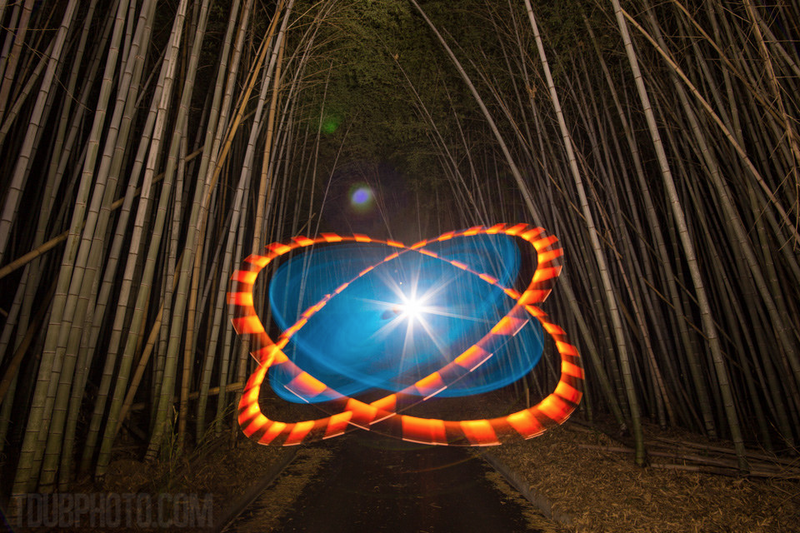 Light-painters call it the 'Lens-cap Trick'. The best way to accomplish this 'Lens-cap Trick' yourself is to have two tripods with the same quick-release plate, that way you can quickly set up different positions and remove the camera and set it up easily on another, just remember to cap your lens while you move the camera from one location to the next and re-adjust your focus each time. If you're in the market for a killer tripod that won't break the bank, check out this lightweight and ridiculously strong Pro-series 'Dolica' Carbon Fiber Tripod for about $100. I've been using the same model for the past year or so and I am thinking of getting another soon - for this price it can't really be beat! Other carbon fiber tripods can cost 5x the price! Back to the 'Lens-cap Trick', first set up the tripods in two different locations, I chose one up close to a fireplace (close focus) and another further away from the camera to draw the heart (long focus). The idea is to line up the two separate compositions so that they are relatively seamless and look like one surreal photograph. It requires getting the exposure accurate and in focus for both composites - this takes a bit of trial and error to get just right - you have to remember the focal length for each exposure. After the make, I wanted to try another more ambitious shot where I set the tripod up outside in my backyard by an interesting V-shaped tree. For the image below it was more like 3 exposures - First I exposed the stove (lit w bare Night-Writer), then I capped the lens and started a small fire in the stove. 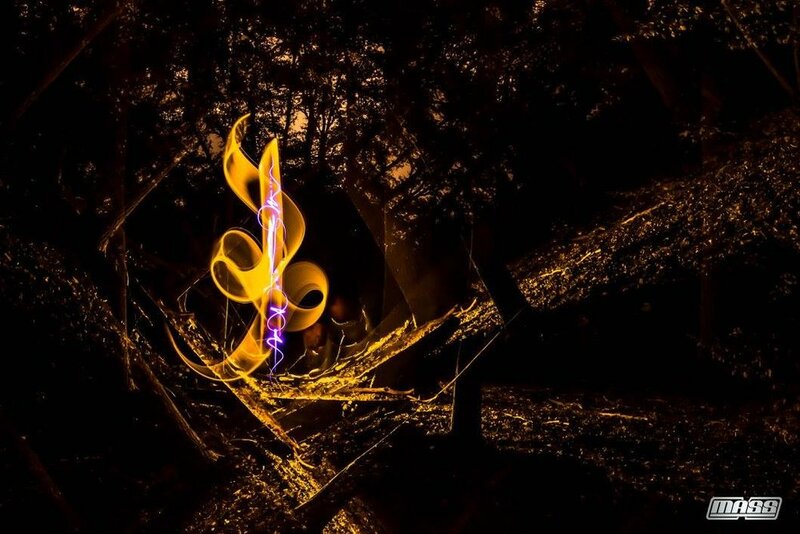 Next, I took the lens cap off to expose the flames (2nd exposure) and capped it after the fire had burned a bit. Lastly, I moved the camera to the outside where I refocused and exposed for the 3rd time toward the 'V-shaped' tree in my backyard and drew in the light-skeleton with a clear-tipped Night-Writer. Give it a try the next time you're in the right place for it! The 'Lens-cap Trick' is one of the more advanced techniques for light-art and takes a bit longer to master than almost any other kind of shot, so please be patient and give yourself plenty of time to try and fail... If you don't give up, you will eventually succeed. Stay Bright! Since my last blog post, Astrobandit and I have become new homeowners. It's been a wild process but I will be happy to be doing my work in the mountains about an hour and half drive from my previous residence in Los Angeles, CA. At around 5000ft elevation and hardly any light-pollution, this place is ideal for night-photography. 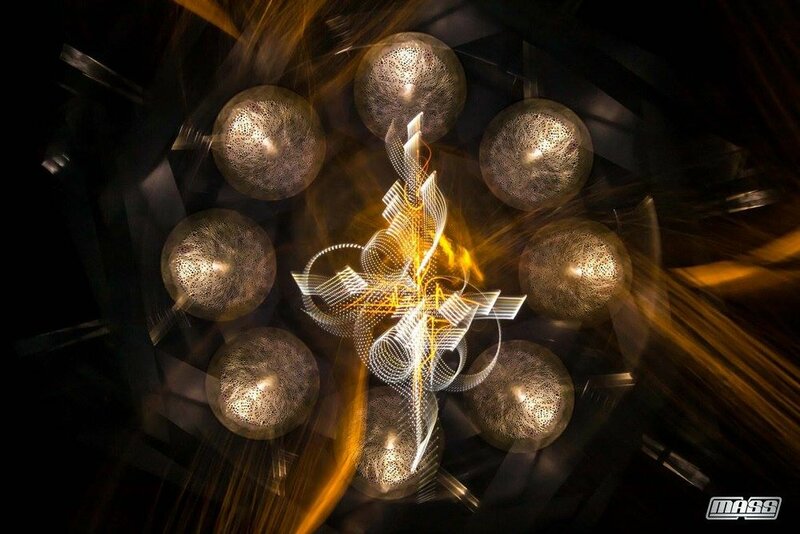 I hope to host fellow light-artists if they wish to visit in the future - perhaps do some workshops.. I see many collaborations happening in and around this house! Let's take a quick trip inside for a moment, here is the loft-space where my cat likes to tempt fate. Yes, that is a disco ball hanging from the ceiling.. I've only pointed a laser at it once. A special feature of the house sometimes happens around 7:30am, if there are no clouds and the sun is out during the right time of year, the disco ball lights up for a few minutes after sunrise, it only happens when the light hits just right! This area of California sits on an intersection of sorts between two mountain ranges - the Coast Ranges (West) and the Sierra Nevadas (East), North is the Central Valley of CA and South, down several thousand feet, is the city of Los Angeles. One of my favorite things to do recently is explore the surrounding areas, most of which are accessible by ridge routes that connect winding mountain roads through places like Ojai, Carrizo Plains, and around Santa Barbara and San Luis Obispo counties. Here (below) are some crows flying high above Carrizo Plains National Monument a few days ago. Here (below) is a hillside full of small yellow wildflowers, I added in some other light-flowers with my commentary on heredity. Of course I take my trusty Night-Writer along on each of these road-trips.. So I can draw philosophical things, like 'Why did the chicken cross the road?'. I was content with a sidelines view of the sunset instead. 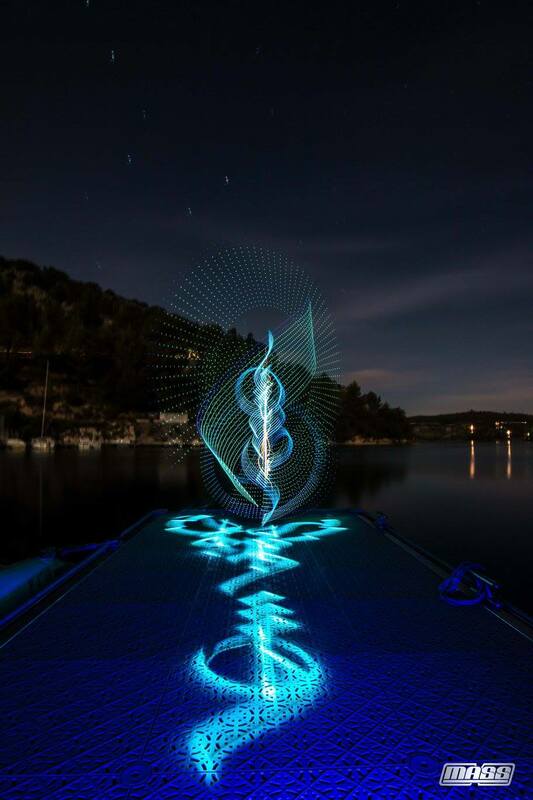 After changing my initial goal of reflecting light-art on the water, I began writing a phrase I've found truth in over the years. My interpretation of this phrase is somewhat similar to Karma, sow light! I feel like I've been hibernating for a bit.. But all that's about to change with Spring in the air! Here's a quick animated loop I made with the most recent version of my Night-Writer prototype at Walker Canyon nearby Lake Elsinore. You can see these flowers off the side of the 15 freeway and they make the hills look like they were covered with Cheetos from a distance. Closer up, they are actually vast fields of wild California Poppies and a very popular place to visit for photographers. The beauty of this bloom is a sight to behold, supposedly the best in over a decade. All these flower fields in bloom gave me an idea for a light-drawing, so I did this quick sketch and have been thinking of it for a little bit. It seemed appropriate. First, I used a remote triggered pod-light to cast red up from the base of the flowers around my soon to be light-drawing for about 10 seconds. Then, I highlighted the area in front of the flowers and up the hill from the left and right side (off frame) w a high-powered white light. After this, I began drawing in my fire-flower with an un-filtered Night-Writer for the starry eyes and color-filtered Night-Writer for the flower itself switching colors from yellow to red and then green. Lastly, I used red EL Wire for the fireball. Out in the desert of Borrego Springs, we visited Coyote Canyon and Henderson Canyon. 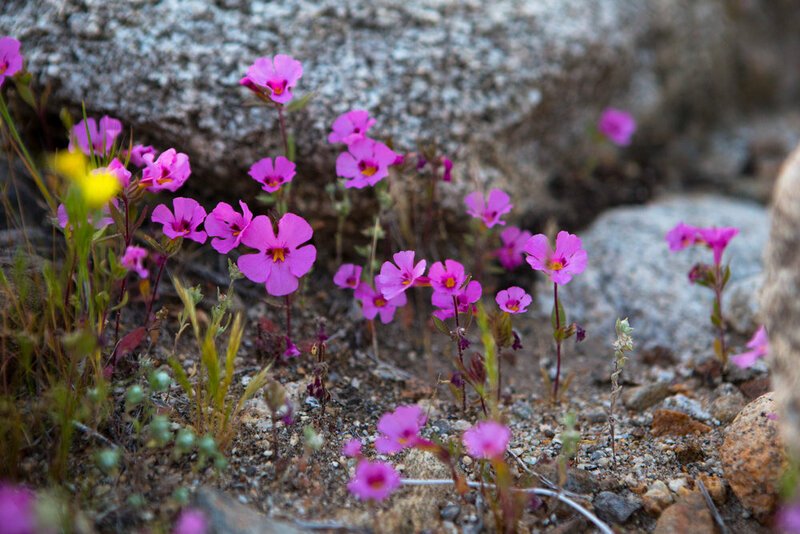 So many varieties of bright colorful flowers in the normally reddish brown areas. 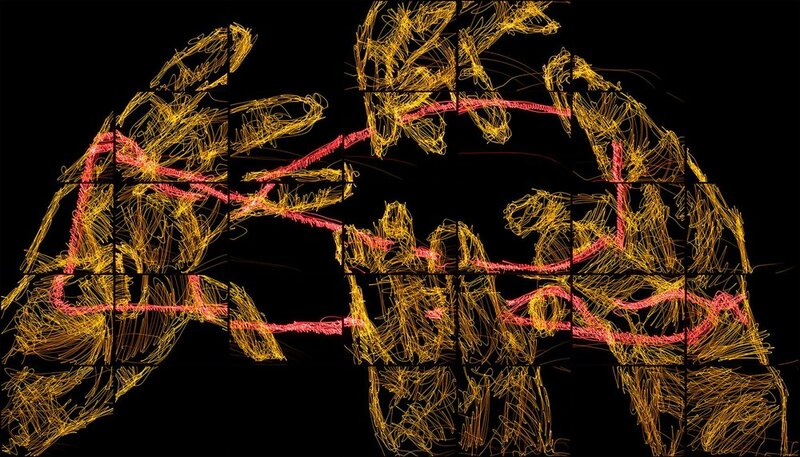 For the next light-drawing, I decided to focus some energy on my 'Insects' series. Here's a popular (or un-popular) and spring-appropriate character, the Mighty Grasshopper. The last image I will leave you with was made with a weird color-wheel device I created over the weekend with some color-filters and a skateboard bearing. 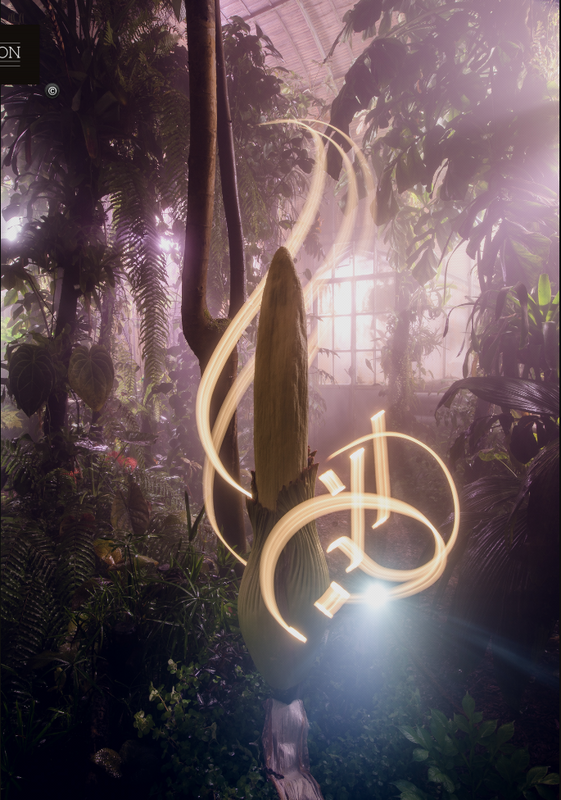 The tool was kind of difficult to work with, but it functioned well enough to draw this 'High Flower' waving goodnight. Here is an idea that took a little while to coordinate and a long while to actually accomplish. The idea is always the easy part! Special thanks to Joey for helping set this up and borrowing his camera to get a second angle (below). These are the sorts of projects where it helps to have a light designed for drawing! Animation is one of the main reasons I started making my Night-Writer product. After the 20th frame, no matter how much experience you have in animating, the mind and body begin to get fatigued. Muscles begin to cramp and it makes finishing the project more difficult to achieve. Luckily a hand cramp is not something I have at this point, thanks to the ergonomic design of my Night-Writer tool. So, how does one animate this sort of thing? Doing this type of work is almost identical to drawing a flip-book. I will say it's a little tougher with light because you can't see what you've illustrated and it has to be life-sized in order to interact with life-sized props. For stationary animations it's easier in the sense that we're not moving around the camera each frame or moving around the character. To do more dynamic animations like on my 'licensing page', I often use markers to move each piece of the scene one step at a time, sometimes its just the character that moves, other times it's both the character and the camera moving for every frame. What song do you think this skeleton is drumming to? After a long drive out of city, through hours of vacant roads in the farm country of the central valley and some curvy roads through wine country in the hills, we made our way to the coast of central California. Here I am spelling it out at Bixby Bridge with a new color-tip design that looks like a crystal (in gallery above). Tucked away in the heart of the California coastline, Big Sur has some of the darker skies in the country and you can see bright stars at night. 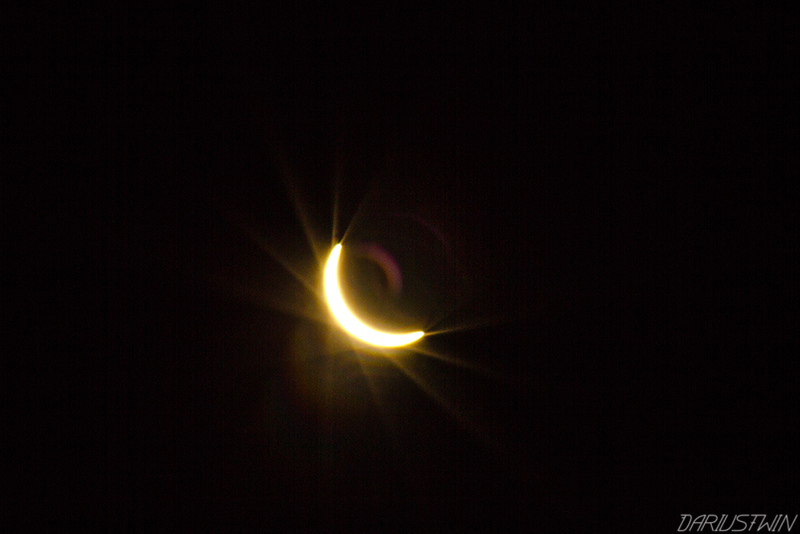 During a new moon, it was ideal astrophotography conditions. It was difficult to pick out constellations you could see so many in the sky at once. Last image I'll leave you with is one of 'Sea and Space'. 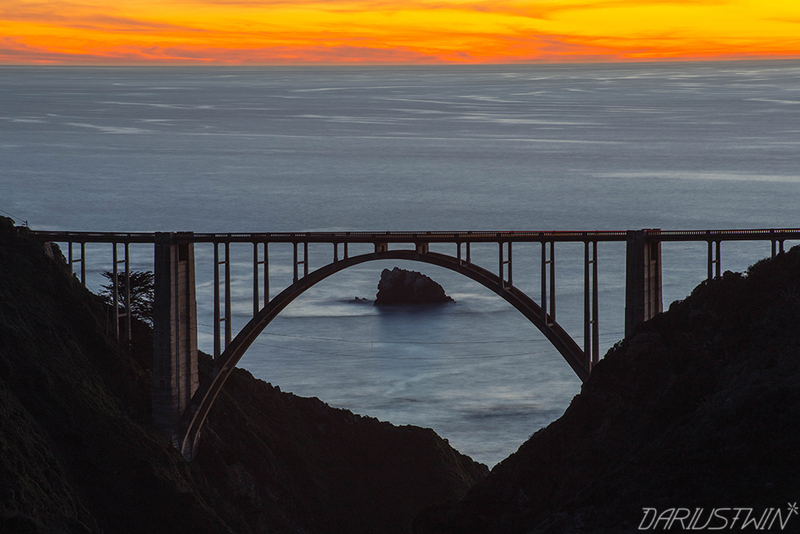 See more posts about Big Sur, CA by clicking this link. 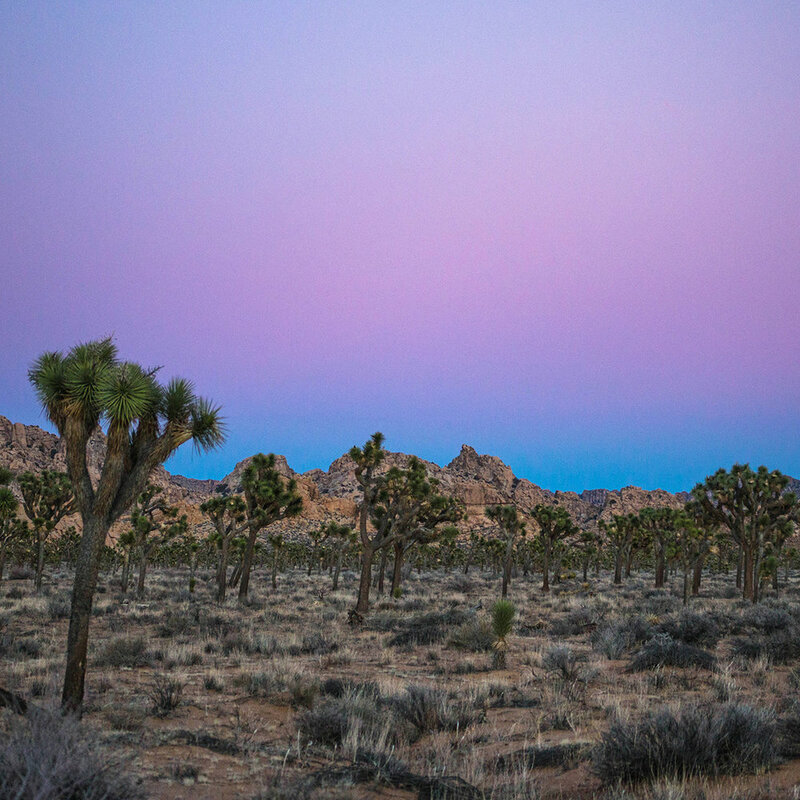 During this time of year in Joshua Tree the temperatures can drop dramatically at night, the higher elevation (around 2700 ft) certainly adds to this effect. 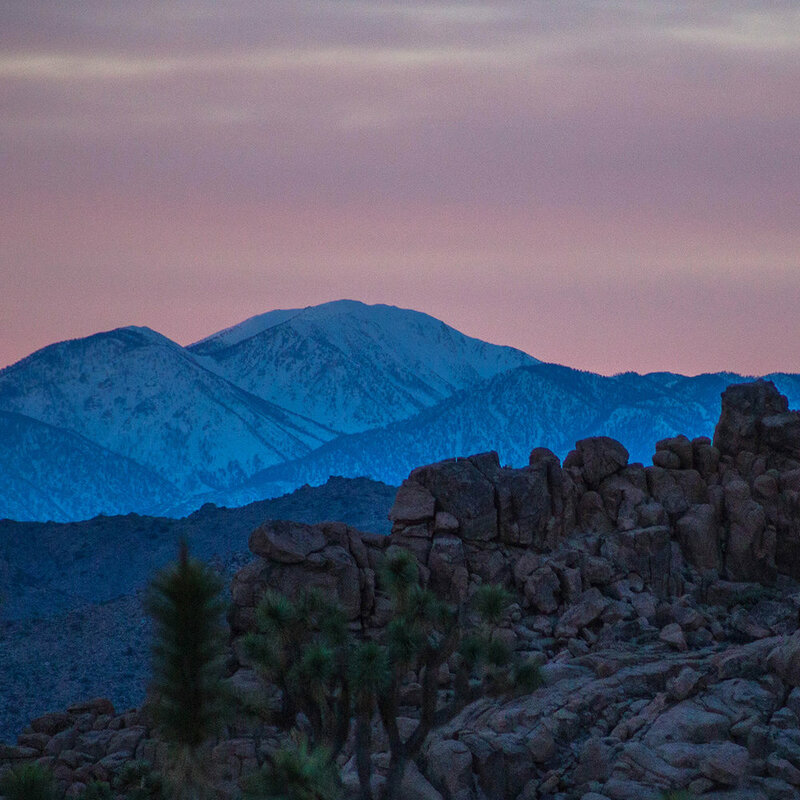 It can be 60 degrees during the day and 30 degrees once the sun goes down, make sure you pack a good jacket and layer-up if you plan to visit. 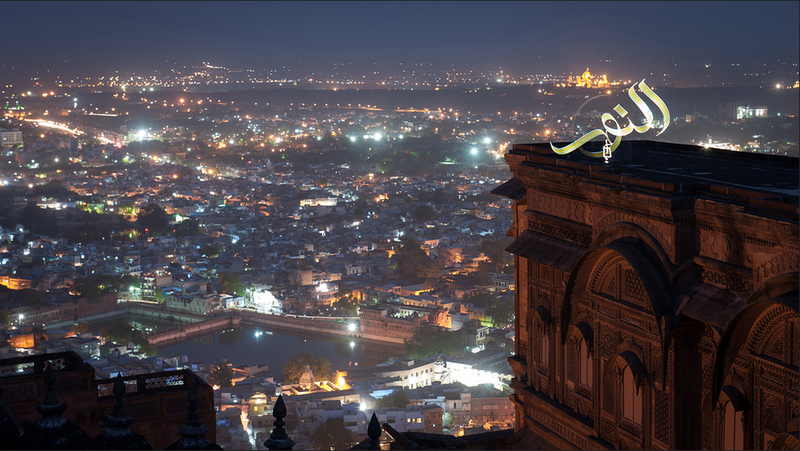 Sunrise and sunsets create vibrant transitional colors in the sky, and at night the backdrop of space itself appears bright and unobstructed by city lights in the distance. The occasional passing car lights define narrow paths cut through the park, highlighting mounds of giant boulders. Here I am setting up the next shot, I wanted a western shootout look with one character in the foreground and another far off in the background eating lead. I was hoping to get a bit of that fading sunset color in the shot. Later that night we headed to a really cool place called Cactus Moon Retreat, and I drew a cactus and moon in one of my favorite rooms in the property using my newly designed jumbo Night-Writer tips. Here's a sneak peak at what some new modular (and larger) color-tips look like up close, I plan on making these available soon but need to fix a few minor things about the way they clasp together first. 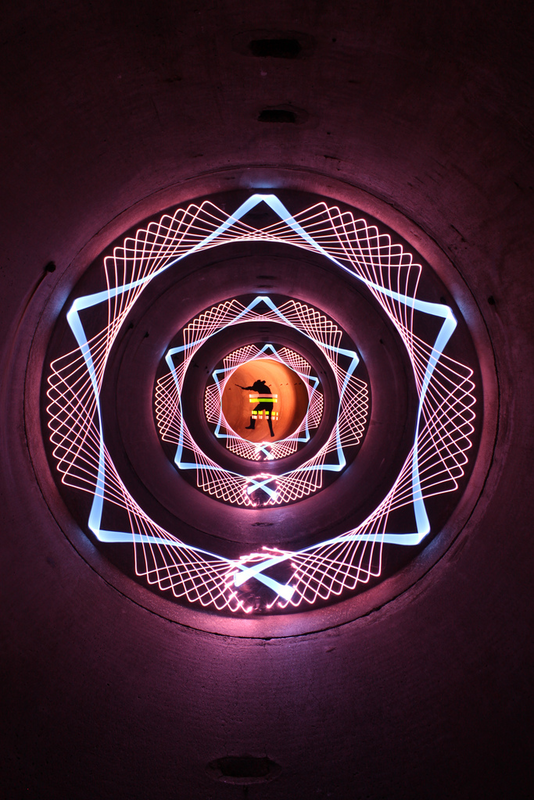 Here's a short GoPro video I captured while trying to create the images in this post, hopefully it gives you a good idea of what making light-drawings is all about. We'll finish this post with the 'Devil you Know', made with a red modular tip and a really bright white LED to create some flares over the eyes. 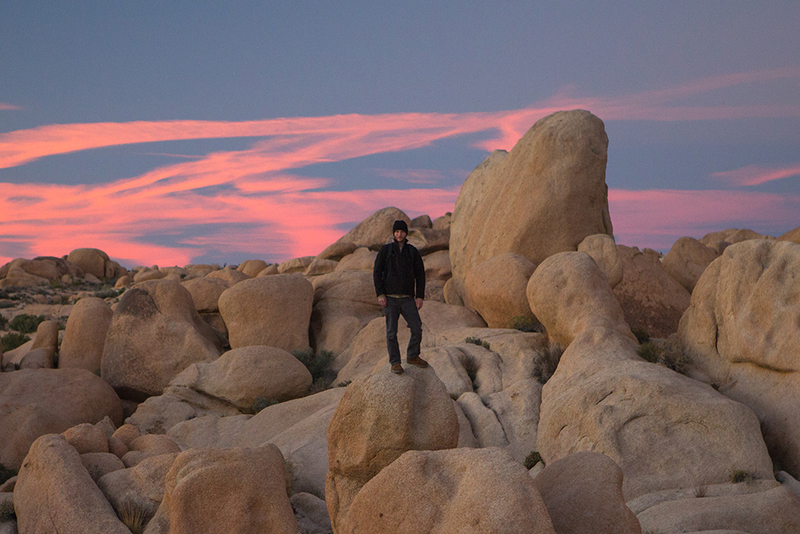 Click Here for more articles on Joshua Tree, CA. 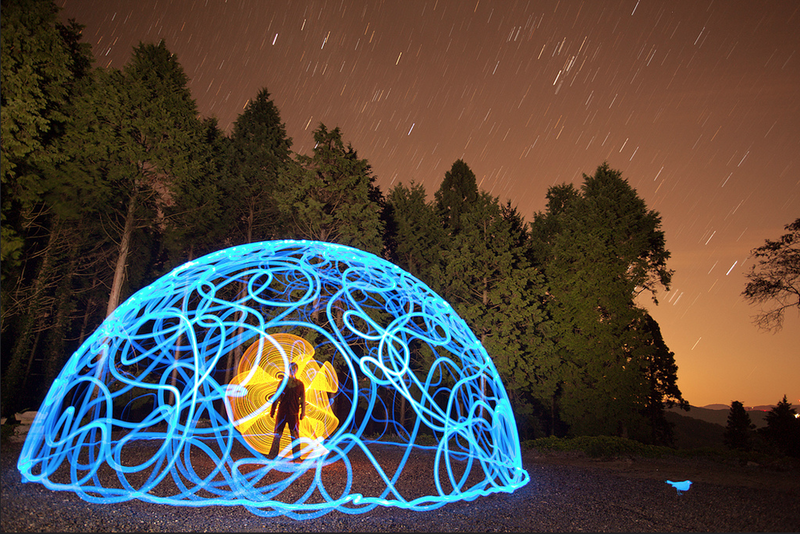 The quote by Aristotle, "The whole is greater than the sum of its parts" can be applied to light-painting as an art form. This year (2017) marks the 10th year I've been at it, and I've been keeping track of everyone involved in its progression throughout the years like any true fan would. I have some favorite photographers I'd like to introduce you to in this post, many of which I've had the pleasure of meeting first hand and collaborating with, I've stayed on some of their couches in foreign lands, I've gotten lost down dirt roads in the middle of nowhere with two flat tires and low on gasoline, I've spent time and broken bread with these people having adventures I'll never forget. Here's hoping for many more adventures as the new year begins. This list is by no means comprehensive, and I may add to it over time, but this post will give you a good idea of what else is out there in terms of different talents & styles in the field, and I'll narrate for you. Dana from Minneapolis-St. Paul Minnesota was one of the first long exposure artists I followed from early days, his long exposure work hits you in a wild alternate-reality sort of way. 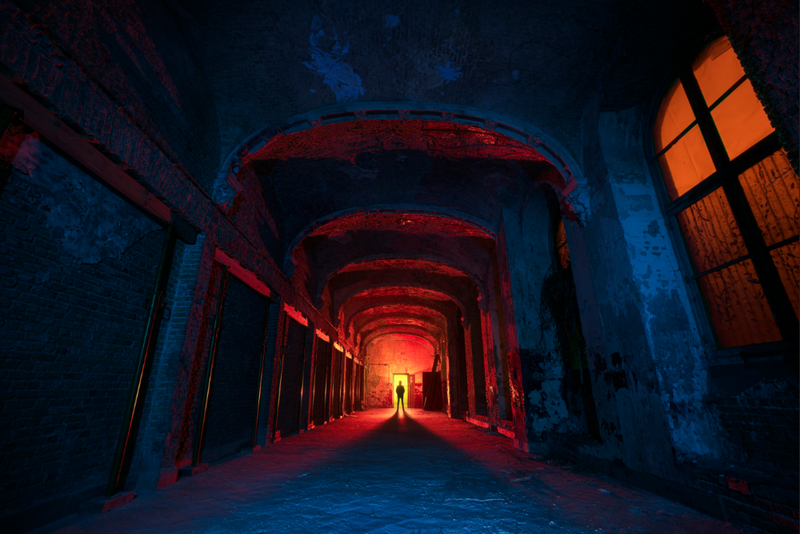 Some of my favorites from him include innovative techniques he came up with including lens-swapping during the exposure, kaleidoscopic tripod appendages, and spiro-graphing lights inside extensive drainage tunnels underneath the city. 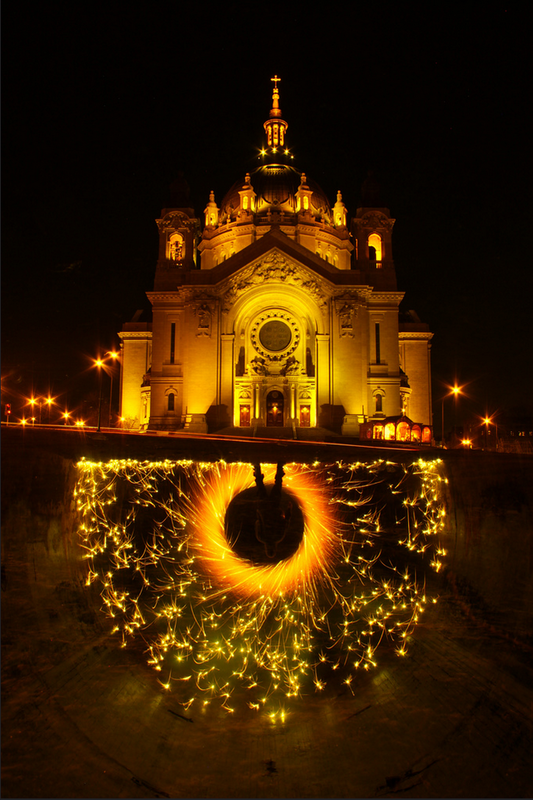 Pala Teth, from Liege, Belgium has a distinctive style often using secondary colors (and fireworks) to achieve directed and explosive lighting effects. His work is thoughtful and well executed, there is a clear vision to each scene, a natural story-teller. Janne is already a talented painter, you can see this skill shine through in his light-art style. 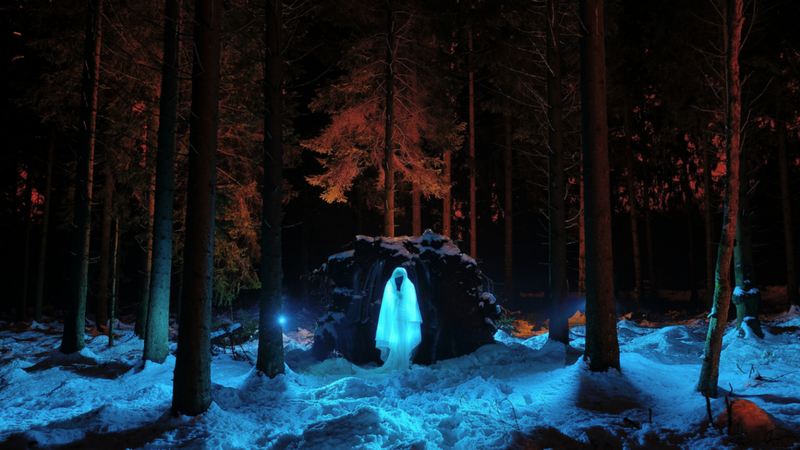 Part of Janne's work is characterized by its topographical appearance. In addition to his outdoor images, Janne creates entire worlds inside his dark studio using forced perspective, white chalk lines and other ingenious optical tricks. 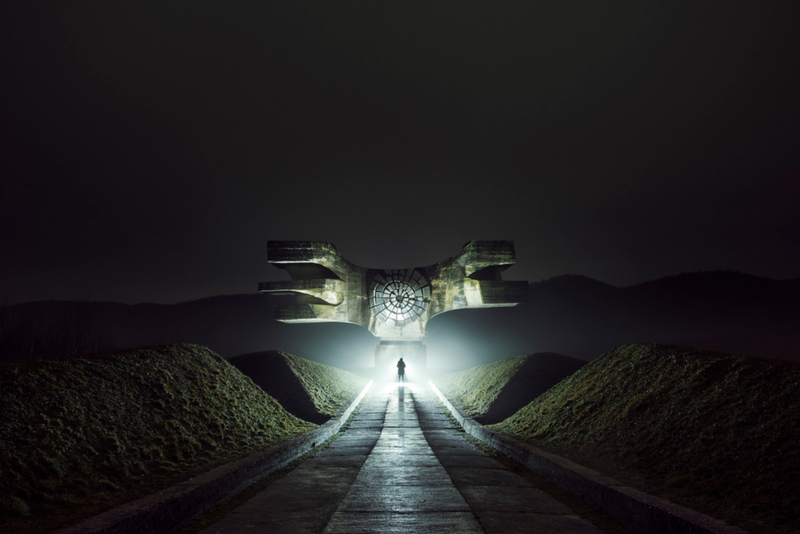 Xiao Yang is an urban explorer from Beijing, she travels extensively and captures a sci-fi like reality of nocturnal landscapes and forgotten architecture. Much of her work is with massive buildings, often juxtaposing a human being for a sense of scale. 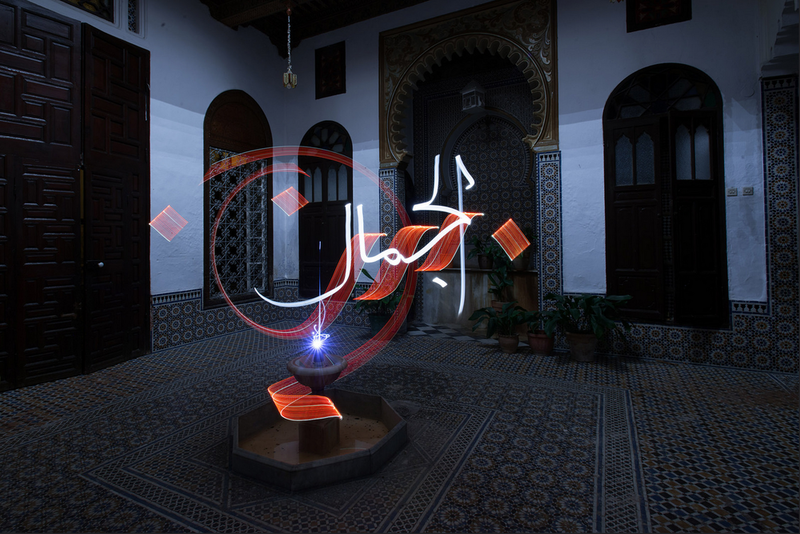 Julien is a Calligraphy artist that has used light-painting to take his skills to the streets and above the city at night. His control of the light is what impresses me most along with incorporating his work well within and around 3D spaces. 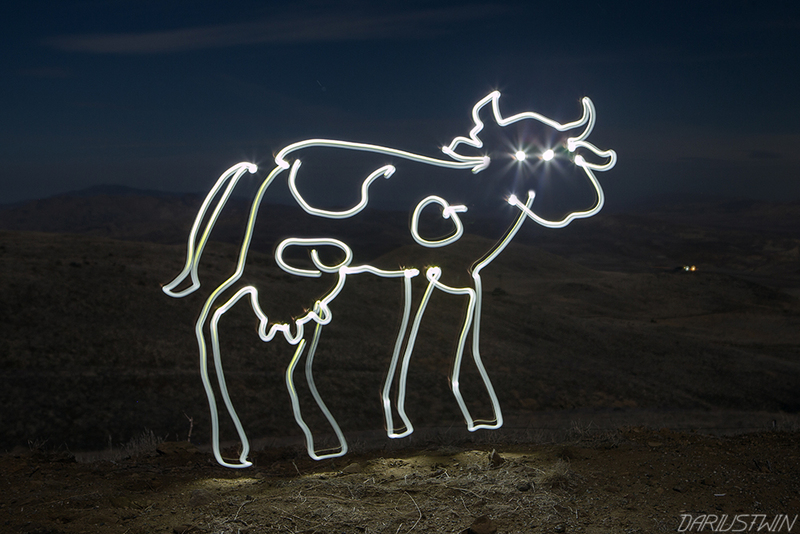 Dennis is a light-painting artist from Alabama, I'm a big fan of his super-hero (or anti-hero) images with light-art. You can tell his work by the silhouetted subject with the light usually featured as a source of power bursting out of the main character. If his work was a story, it would probably be a time traveling tale. Alfredo (or Frodo as his friends call him) is a Spanish light-artist from Oviedo in the Asturias region. 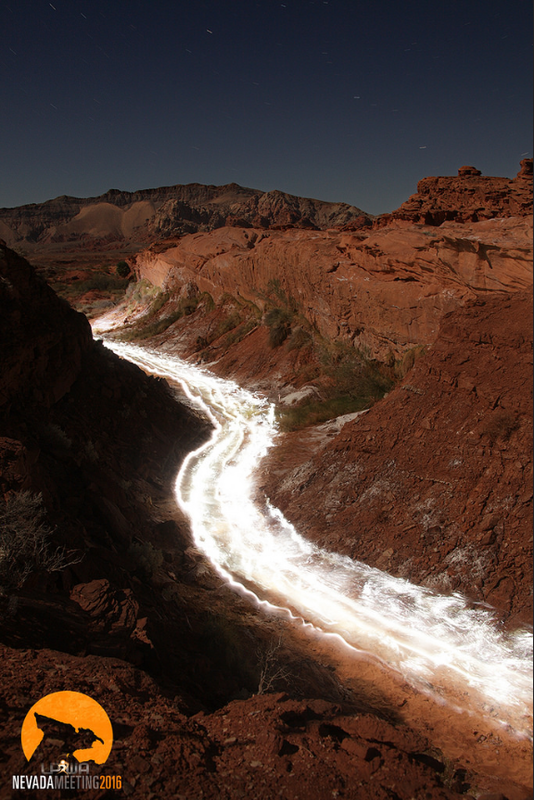 His most recent work is massive, organizing many light-painters together for one large scale installation. 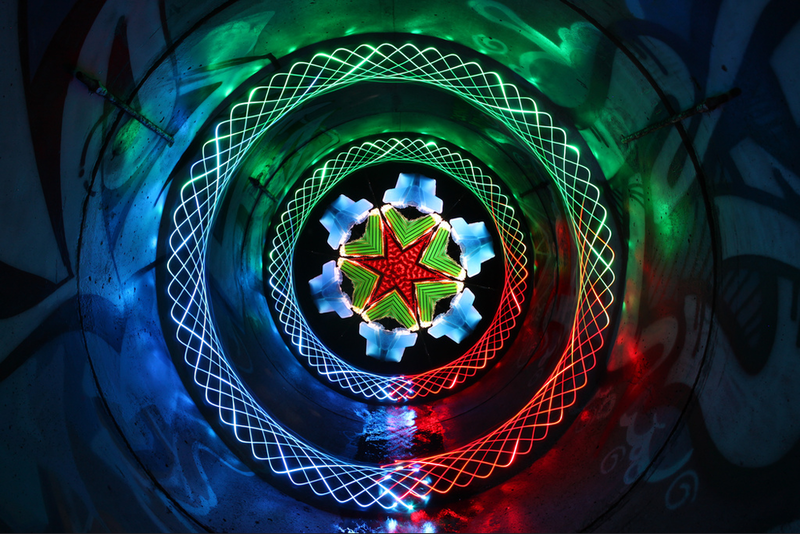 Recently I had the pleasure of working with him in Longhushan, China where we installed a massive light-painting inside an ancient Taoist temple after he and his crew constructed a ten meter tall structure to get just the right perspective. Roy Wang, from Beijing is a talented illustrator and friend I met in Shanghai, he organized our group of international artists while we were in Longhushan. 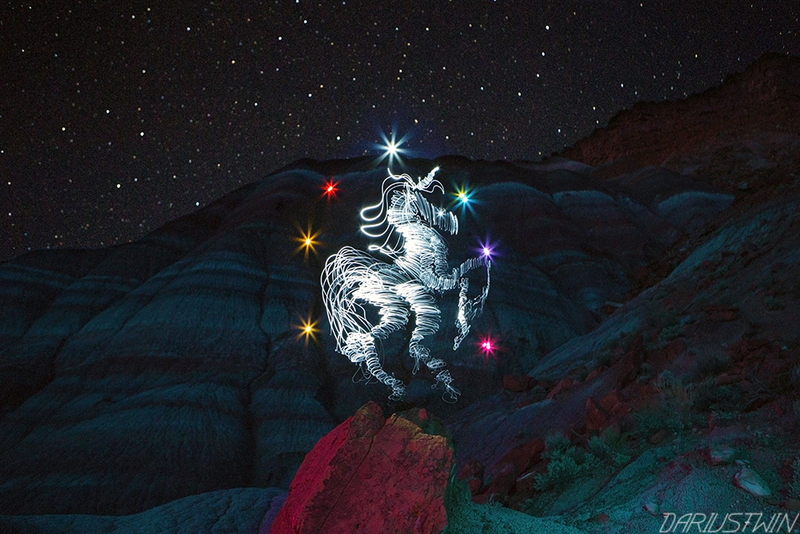 After seeing him light-paint a Chinese Dragon perfectly two times in a row, I could see that Roy could draw just about anything he wanted to with light. Diliz is a master of expression with light, his creations seem alive, like they have a mind of their own. His style is defined by a confident hand and a clear artistic vision with his often one line light-marks. I first met Eric & Kim while I was shin-deep in the Los Angeles River. 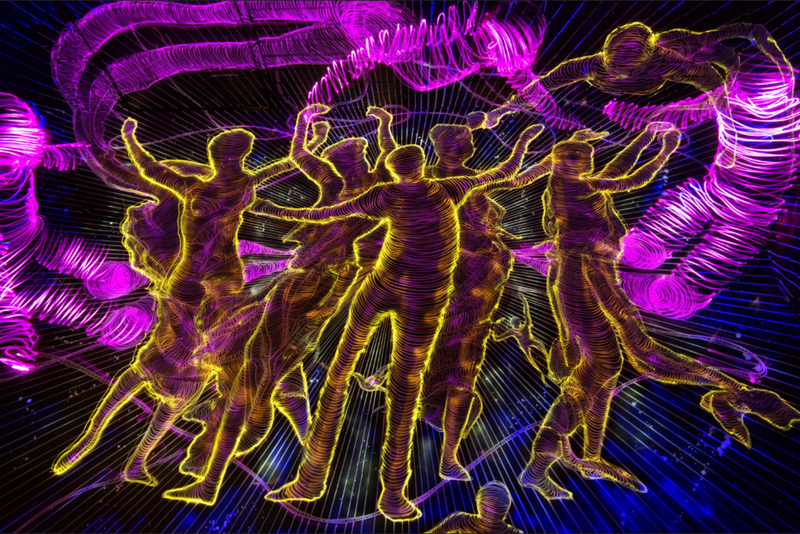 We had planned via email or fb chat to light-paint in the LA river that night around the 6th st bridge, the last image in the gallery below is our first collaboration. I've since met he and Kim a handful of times and it's always wonderful to see them and inspiring to see their progression. 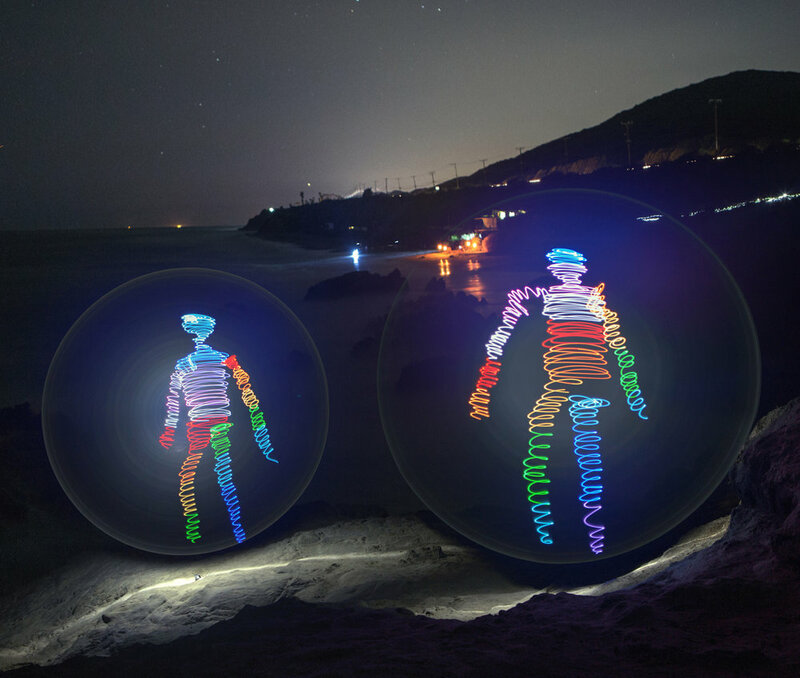 Eric Pare has a really cool project that involves bullet-time light-painting - utilizing 84 cameras to create a wild reality. 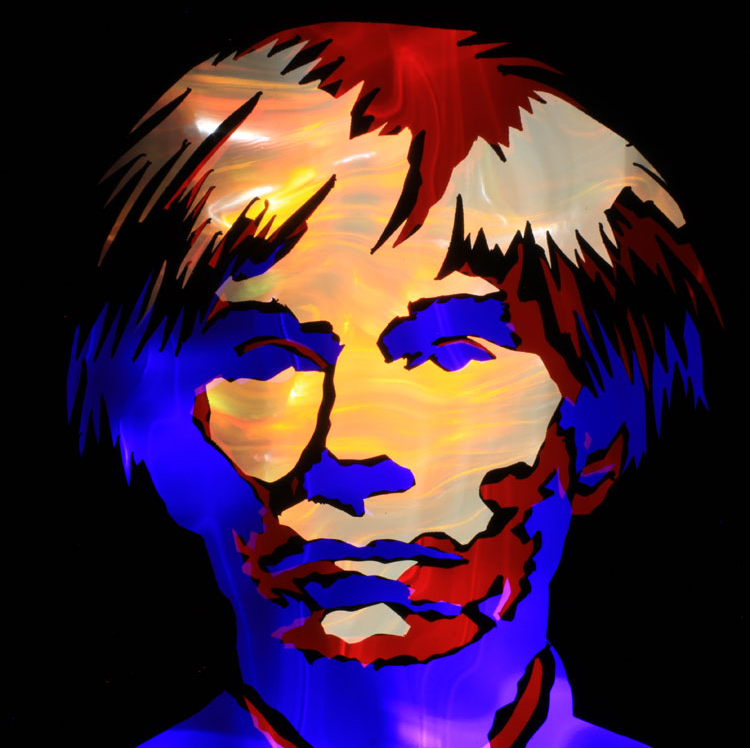 He is also a pioneer of 'tube light-painting' - using plastic tubes with lights projected into the tube to create a diffused and translucent light source that silhouettes his subjects. His model and professional dancer Kim Henry adds a sense of scale, balance and drama into each highly cinematic photograph. Astrobandit and I once took a roadtrip to the Southwest and ended up meeting Eric and Kim in Moab, Utah. It was a strange and fun chance meeting, neither he nor I had planned to be in the same area at the same time. We collaborated again, at a place called Dead Horse Point - seen in the 'Magic Carpet' image below. 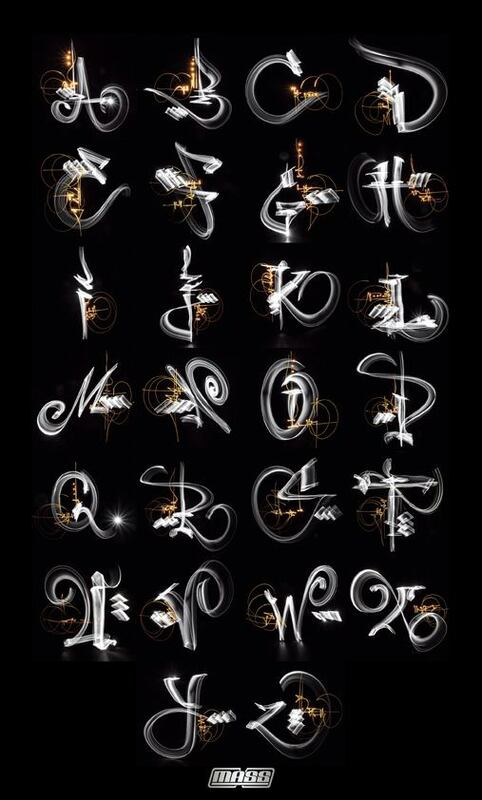 Mass has a fluid and controlled hand that comes through strong in his art with a calligraphy focus. His layered light-work tells a story through movement. Seeing him create live is a bit like watching someone practice martial arts, there are aggressive swipes, steps, and jabs to each shape. 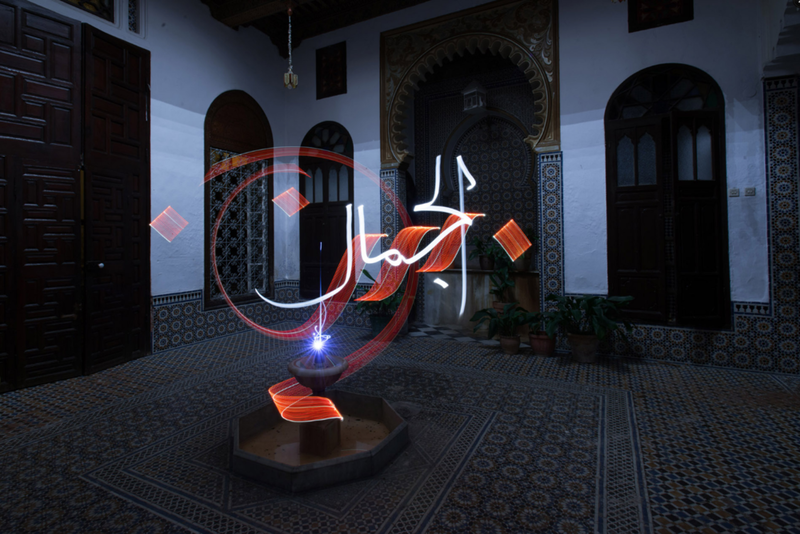 Sergey, from Moscow is the founder of Light Painting World Alliance, an organization that puts on light-art galleries, workshops, lectures, and meetings worldwide through collaboration with host cities. 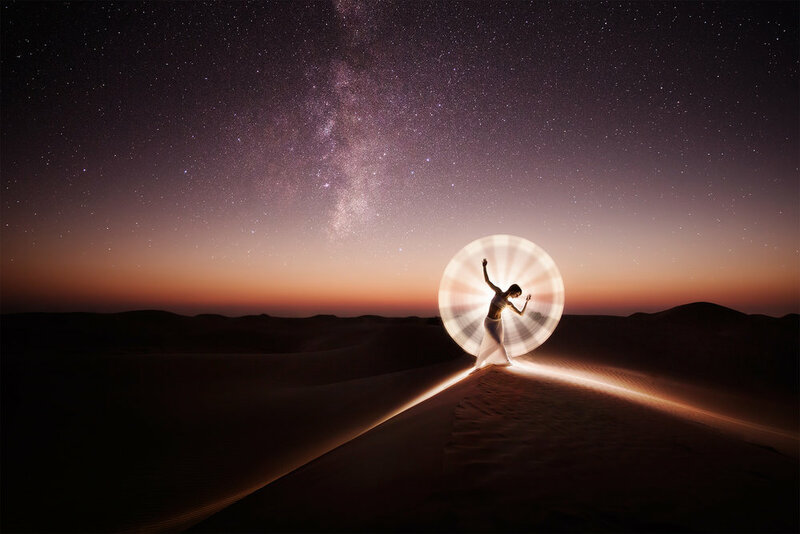 The artist database on lpwalliance.com features light-painting photographers around the world and is a great resource for finding light-artists around the globe. Over the past 3 years LPWA has organized events in France, Spain, Germany, China, and USA. Patrick's style is defined by his special attention to detail. The light textures, color, clarity, and movement in his work appear polished and professional. He's worked with a long list of high-profile clients and has innovated with products like his lite-blade series. Denis Smith's positive energy is infectious, I first got to meet him in Germany during Photokina, and we had a chance to collaborate on an image together while we were there. I'm looking forward to our next collaboration, whenever that will be I'm sure it will be epic! 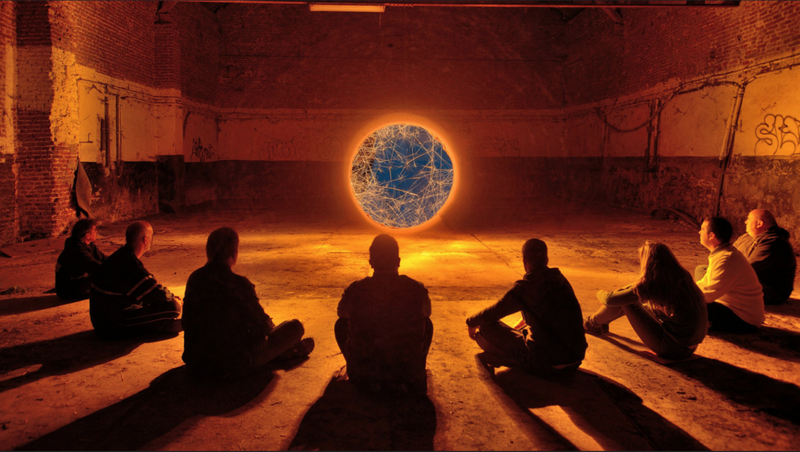 Denis's work is all about 'The Ball of Light' - where it goes, what it does, how it's feeling at the moment, he tells a story through exploration. In addition to his photography, Denis also teaches workshops and does videos that educate the viewer and his participants. He also sells his own light-tools on the shop section of his website. Florida based light-artist Jason Page runs an in-depth website called lightpaintingphotography.com with its own database of other talented light-artists along with a historical section, monthly contests, and a regularly updated blog. 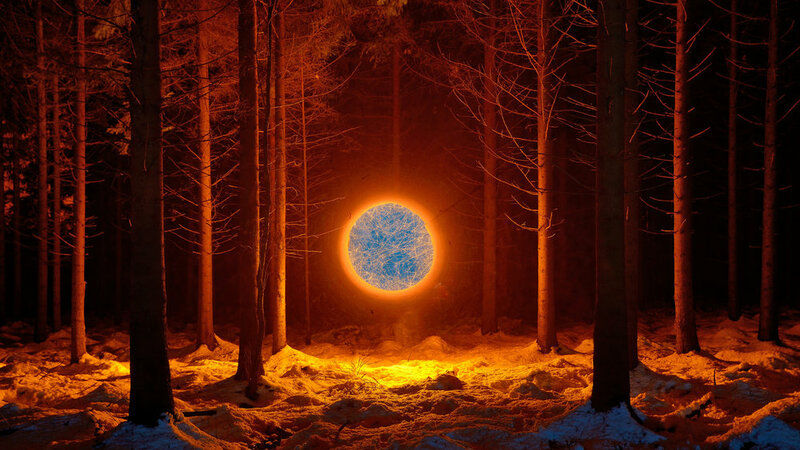 Jason's light-work involves innovative approaches to layered light-stenciling and ghostly textured light characters along the coasts and deep in the forests. 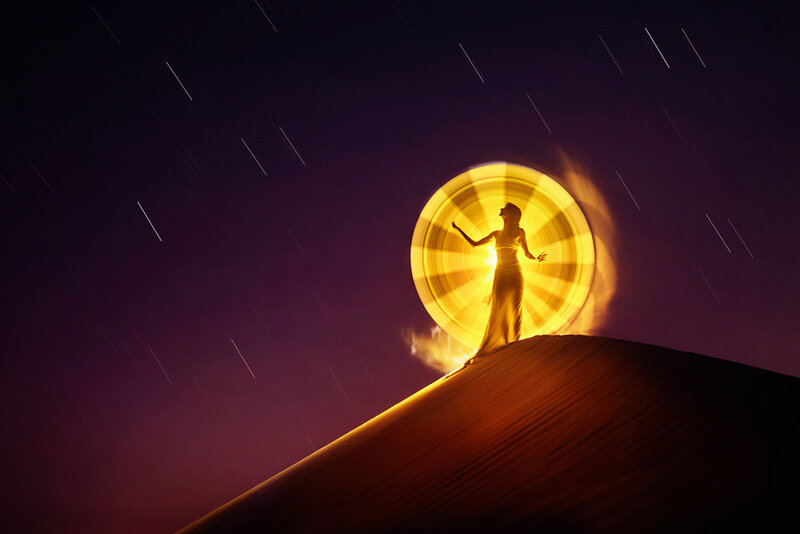 In addition to his light-art and informative website, Jason also invented a useful set of color-filtered light-extensions and textured elements called 'Light Painting Brushes' which you can purchase via his online shop. 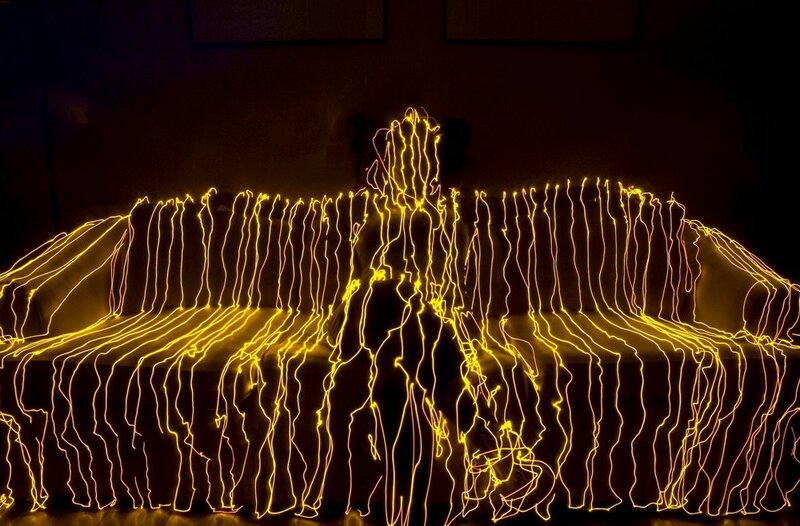 Hugo's work with light-painting is methodical, like a scientist. First comes the idea, that's the easy part. The difficult part is the execution of it over time and multiple efforts. Often after tinkering with an idea for a long time, Hugo will make a breakthrough. I admire his focus and dedication to seeing an idea all the way through despite the obstacles along the way! A few years ago we had the chance to collaborate on an idea Hugo had to try and 'crowd-source bullet-time light-painting'. You can read an interview about it here. Or just watch the video! He got different photographers together (with different cameras) and had them shoot tons of photos over three hours to achieve the matrix-like video effect. 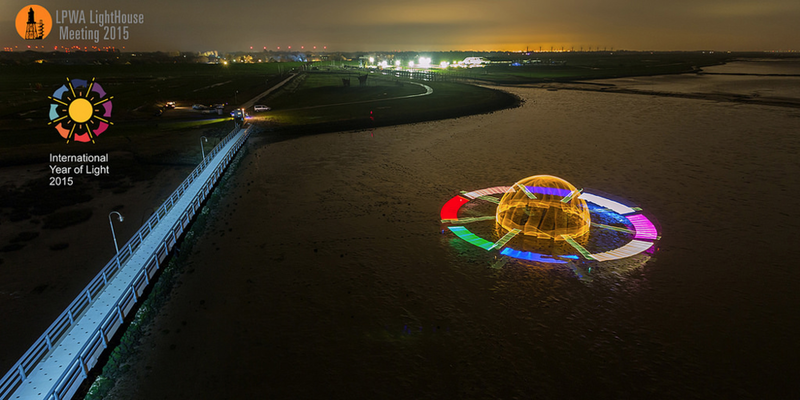 In 2016 we collaborated in the Netherlands, resulting in the last image in the gallery below. No editing there, the effects are done in-camera. Brian's work bears the mark of several arts - illustration, design, and mosaic styles can all be found in his images. He has big ideas that are built piece by piece over time. In addition to his photo-art, Brian may have the world's largest collection of 'VR explorable banana-peels spotted in the wild'. 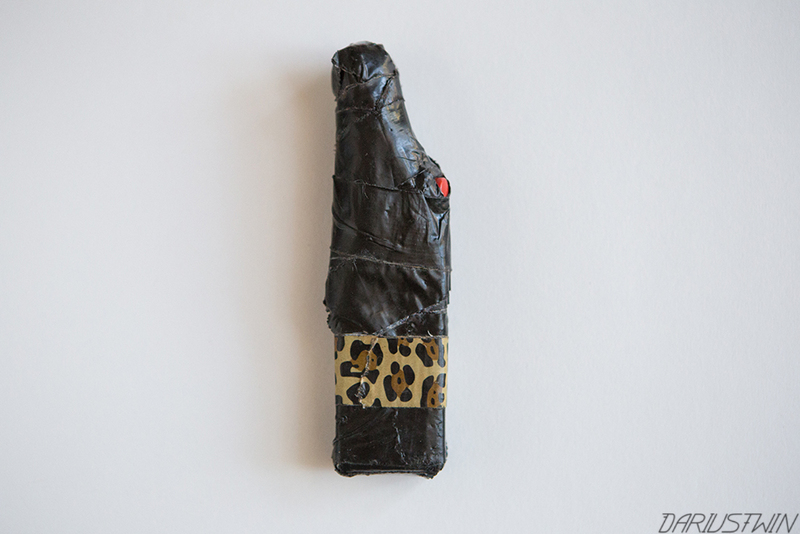 Trevor's work can be characterized by his innovations through countless experiments. Tdub uses models, constructs massive light-domes, produces light-stencils, and sets fire to steel-wool to produce his eye-catching imagery. We once collaborated on an animated project involving light-stenciled Pac-Man-esque characters invading the home of an unsuspecting tv-watcher. 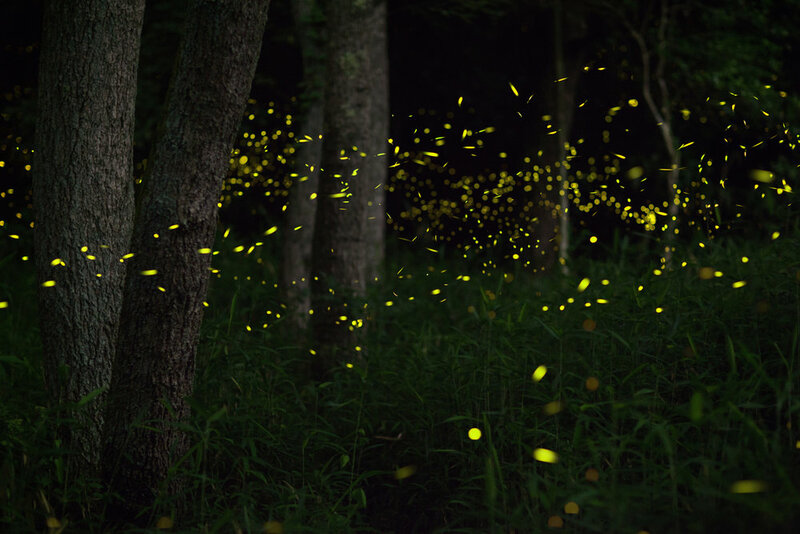 Currently, Trevor focuses on more journalistic imagery, but you can see his skill as a light-artist shine through in his low-light work. 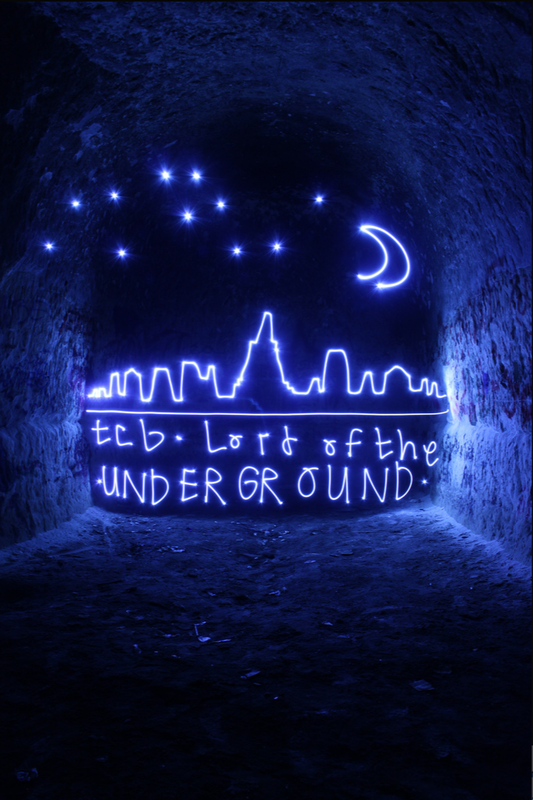 Tig Tab's work is mainly about her detailed and layered light-stencils that she takes to the underground tunnels of Melbourne. An eye for composition, casted light and texture help define her unique style. Tim Gamble uses silhouettes, lens capping, lasers and camera rotations to achieve movie-poster like special effects in-camera. Hannu's work is sculptural in nature, he creates large plant-like installations in buildings, forests, or snowy locations. I've met up with Dan a few times now and it's always a pleasure to see him, the last image in the gallery below is a fun collaboration of ours. One of my light-skeletons surfing the flags of our countries in front of the Hollywood sign. Dan's style is colorful and explorative, his images give the viewer a vibrant place to follow his character deeper into a giant maze of light. Lost America's style is defined by what he photographs, mainly forgotten relics of America in it's prime, now coated with a time-earned patina, and his color-filtered lighting under a full moon in the desert. Troy's work has an eerie but familiar quality to it, much like a Stephen King novel. In fact his work was used for a few of Stephen King's books ('Mile 81' and 'From a Buick 8') and that makes perfect sense to me. It seems like there's always something lurking beneath the surface or hiding around the corners to his images. In terms of the technical, Troy is a pro w exposure time and surface lighting, many have mimicked but few have got it down as well as the master himself. I don't know where to begin with Tacky Shack's work over the years, he throws everything into his light-paintings but the kitchen sink.. And then the kitchen sink! 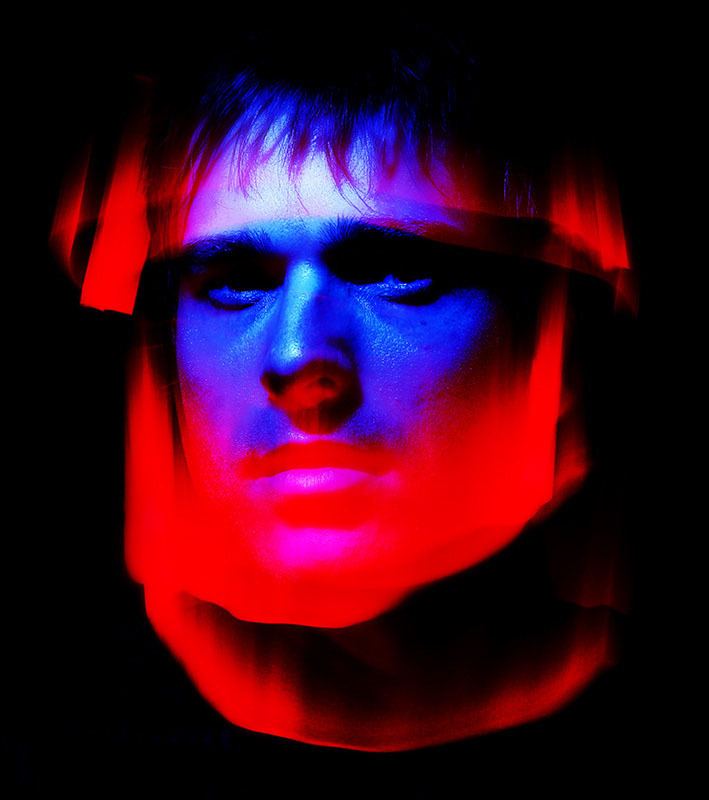 Fireworks, lasers, and strange experiments are ever-present in Jeremy's light-style. Sometimes I can't tell if what I'm looking at is an experiment or if there was artistic intent, then out of nowhere he hits a grand slam and it's way out of the ballpark. Here we are in the freezing Redwoods of the Northernmost coastal areas of California. A place that looks like time was forgotten and Giants remain. Indeed, these trees have been on Earth for around 240 million years. My personal (probably incorrect) theory is that this was once a part of Pangea hundreds of millions of years ago and most of it broke apart and collapsed into the ocean on part of the Juan De Fuca Plate leaving a tiny portion that remains on the coast of the North American tectonic plate. It's fun to think of Dinosaurs once roaming between these trees, but it's another thing to draw them doing it frame by frame in 34 degree weather with a Night-Writer (+ yellow-tip) in the dark. The first thing you have to know about this area is that it's fairly remote and a bit difficult to get to (especially if coming from Los Angeles like us! ), be prepared for many hours of windy roads on the 101 past San Francisco, CA. 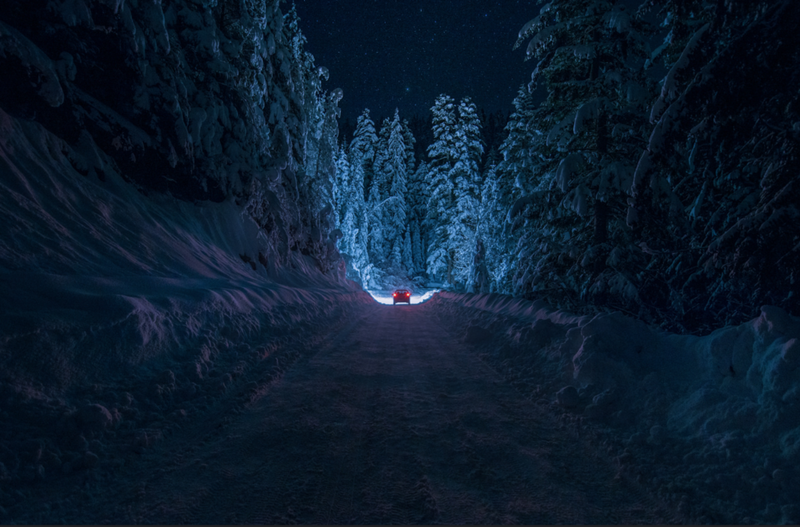 During this time of year it typically gets cold at night and can be rainy, watch out for black ice on the curvy roads deep in the forest, we tried not to drive on these roads too late into the night. Our stops along the way up were: Santa Rosa, Willits, Trinidad, Klamath, then we came down the coast visiting Fort Bragg, Tomales Bay, and lastly Big Sur. Most light-painting sessions occurred just after sunset and until 9pm, after that it got a bit frosty. I drew a 'Lost Rudolph' with his nose so bright on an old bridge off the 101 in an area called 'Lost Man Creek'. I like how he looks a little confused here.. This area was pitch black at night, a bit spooky also. Looks like we've got a hairy situation on our hands here, 'Bigfoot'! 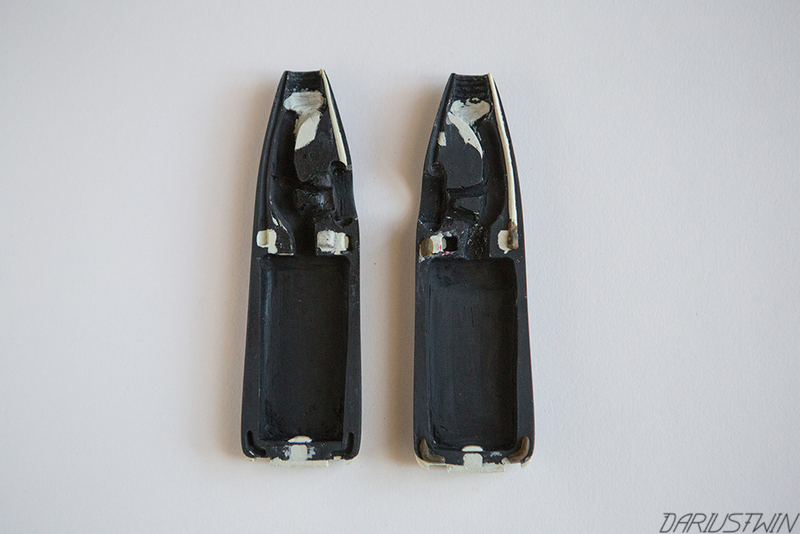 For this image (above) I experimented with a new homemade Night-Writer tip made of cut, sanded, and glued plastic pieces. I can't stress the importance enough of scouting a location first before it becomes too dark in the forest. At night it's difficult to see anything more than 20 feet ahead of you. For the image below I was reaching around in the dark a bit. Here are some of my 'light-skeletons' hanging around this fallen giant in the night, we'll call them the 'Forest Spirits'. Looking further into the forest, I had an idea to topographically map the depth of the trees with a high-powered laser, the result is almost exactly as I envisioned, pretty wild! Here is what 'Laser Vision' looks like. That will sum up our adventure for now, here's a smiley face for you - Happy Holidays! Click Here for more articles about The Redwoods.